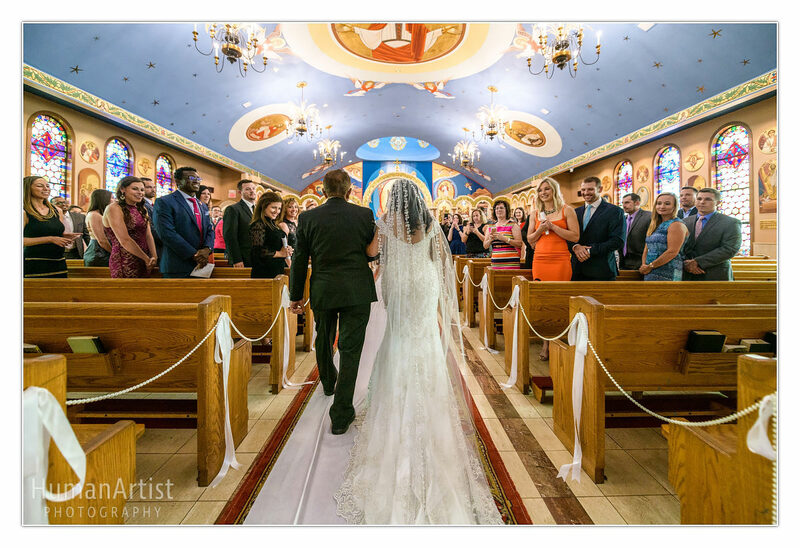 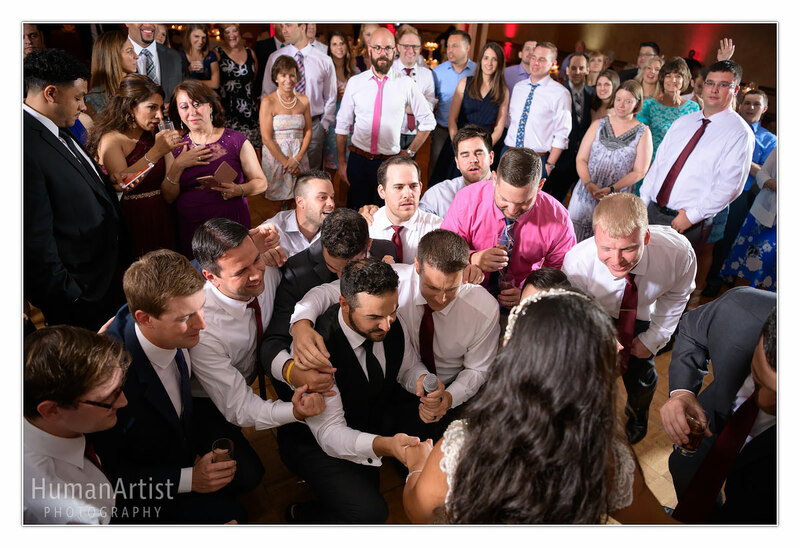 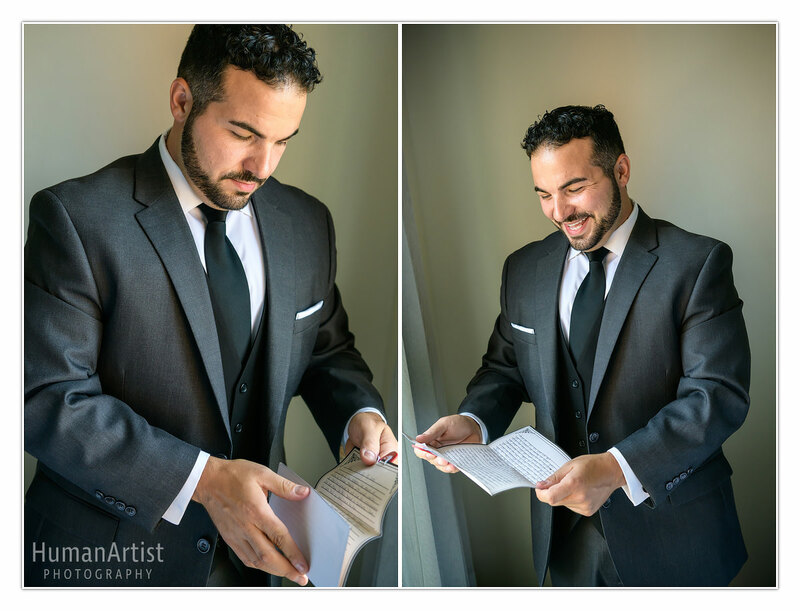 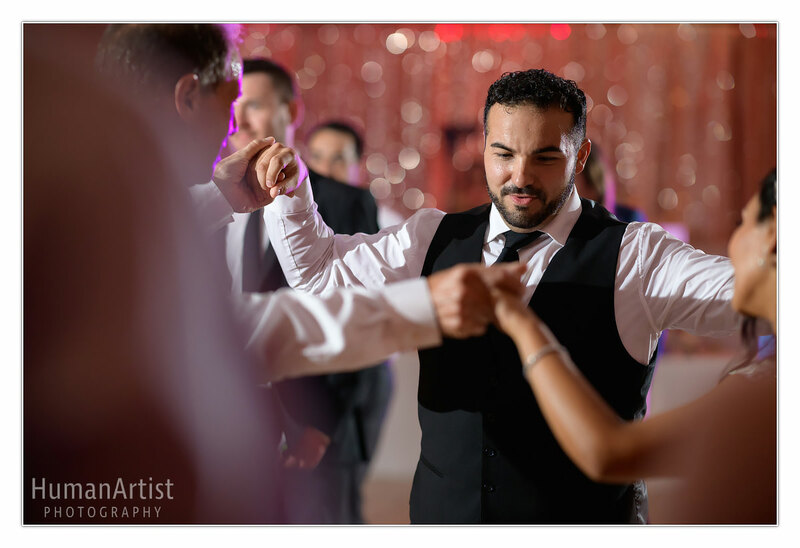 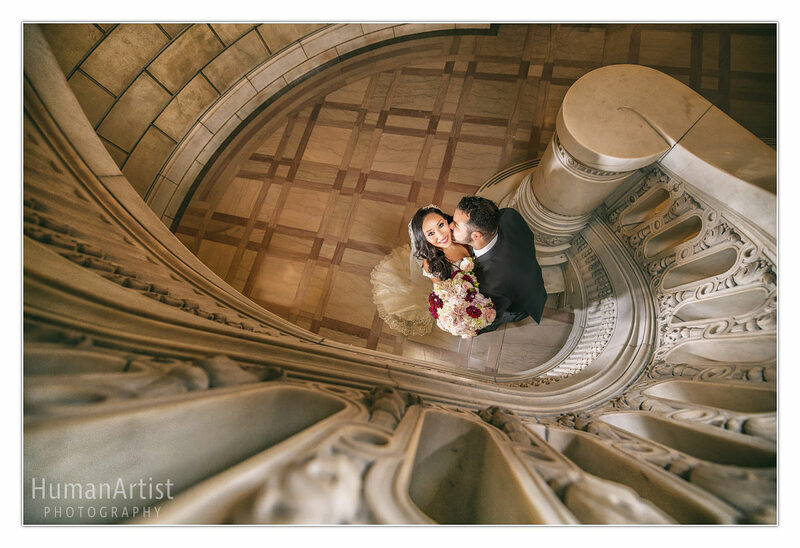 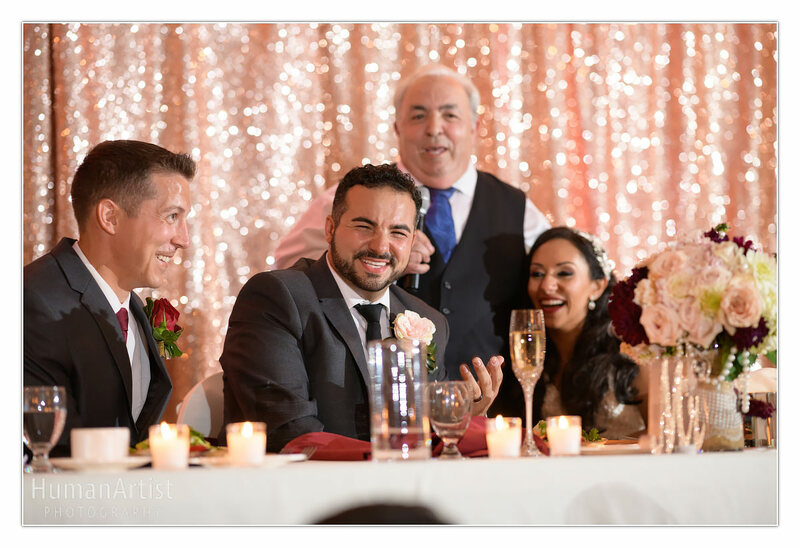 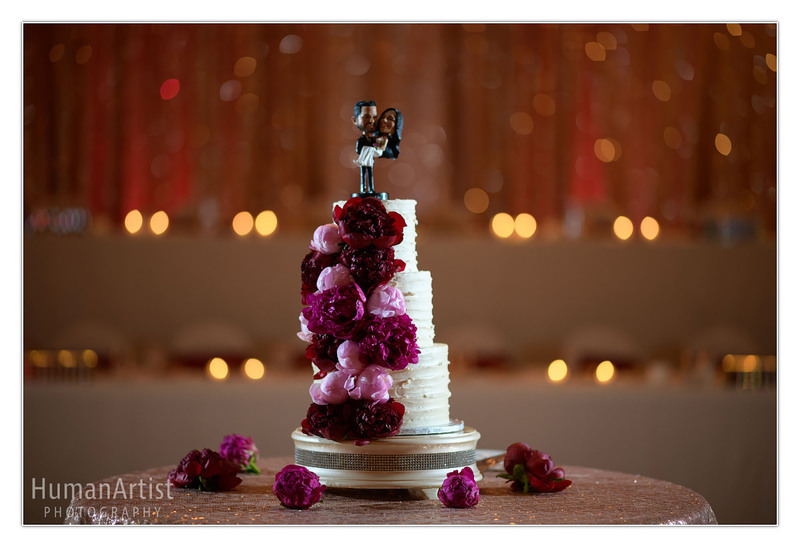 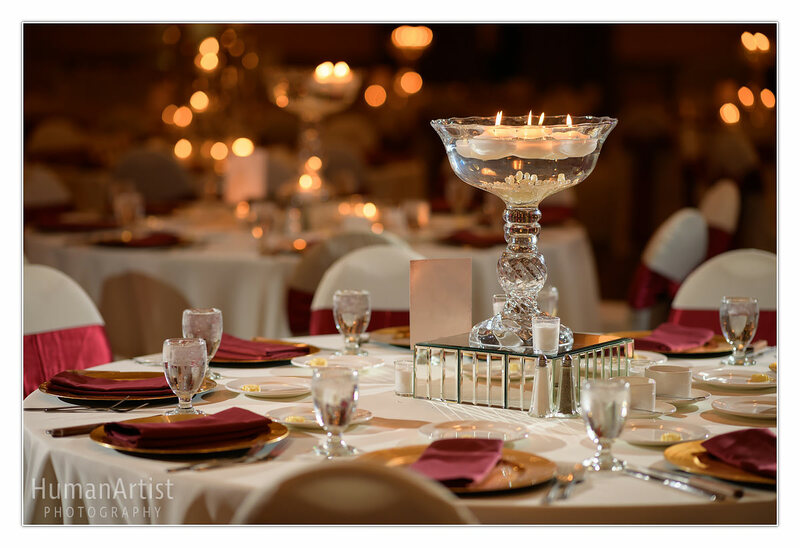 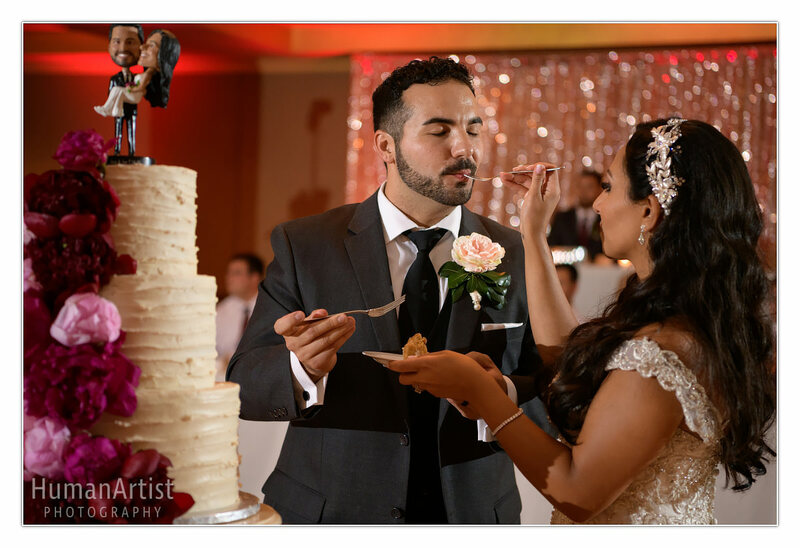 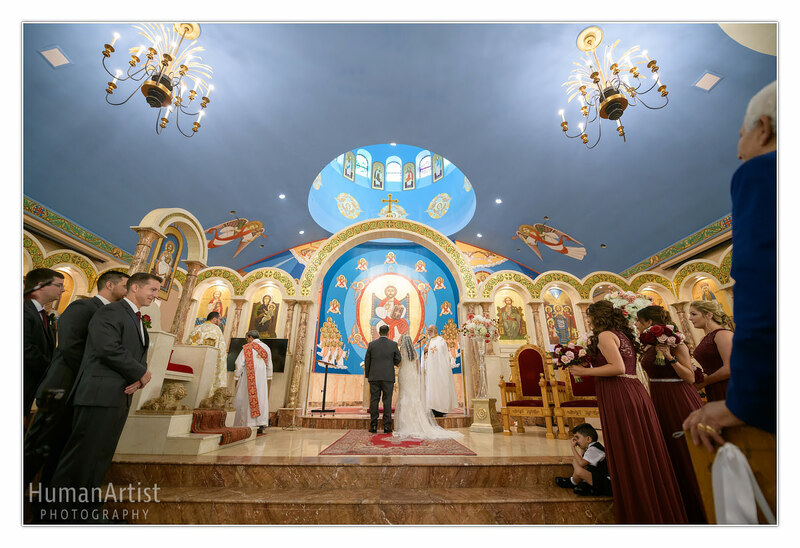 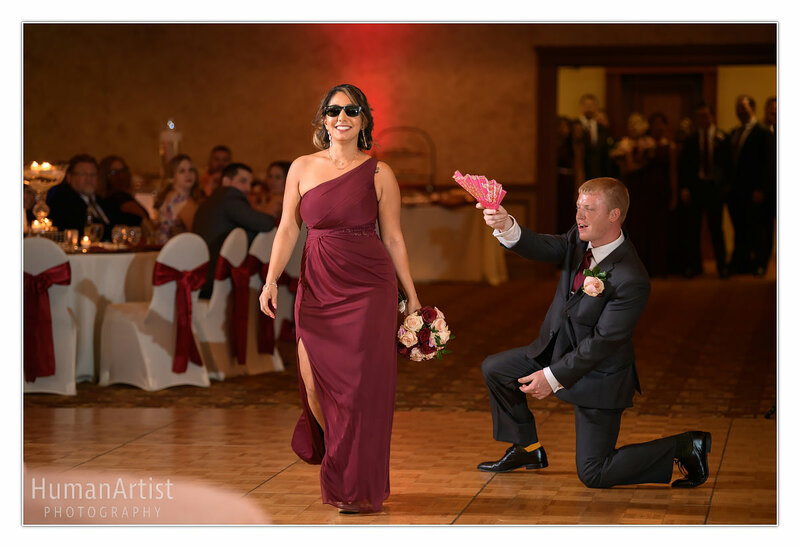 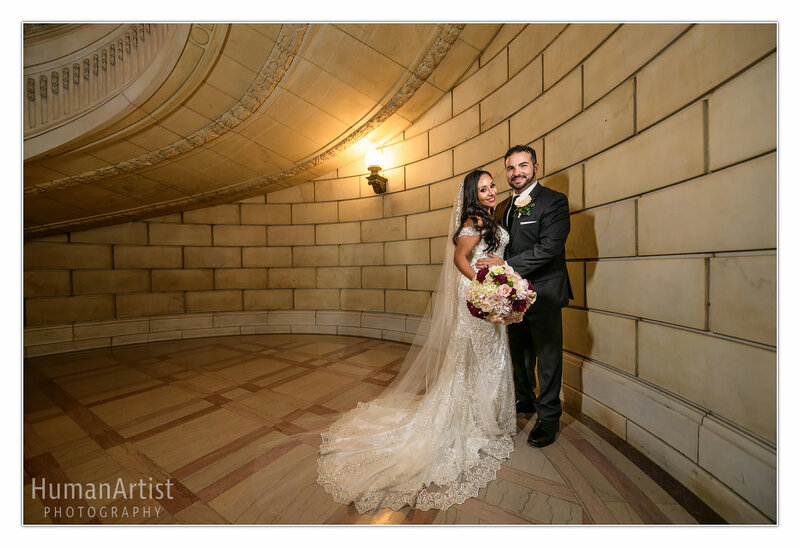 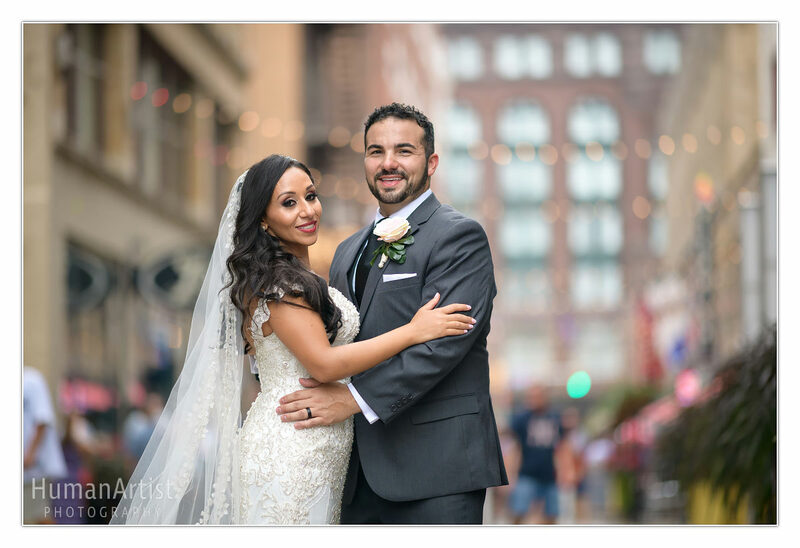 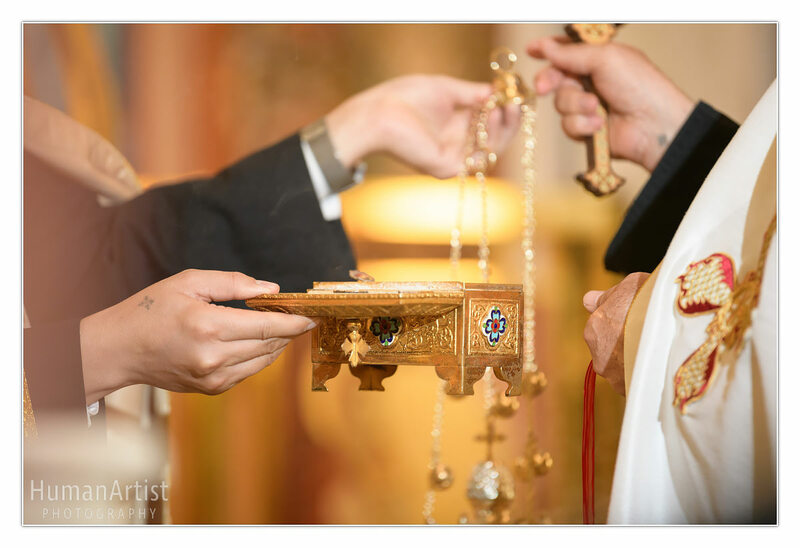 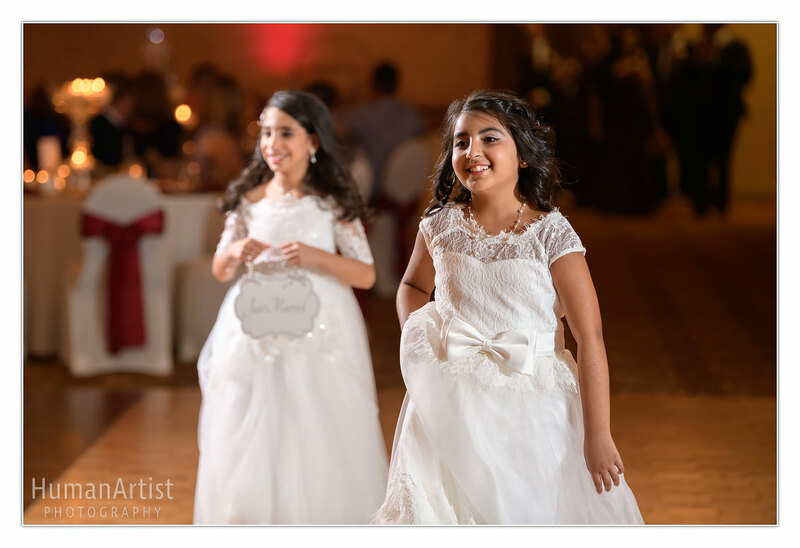 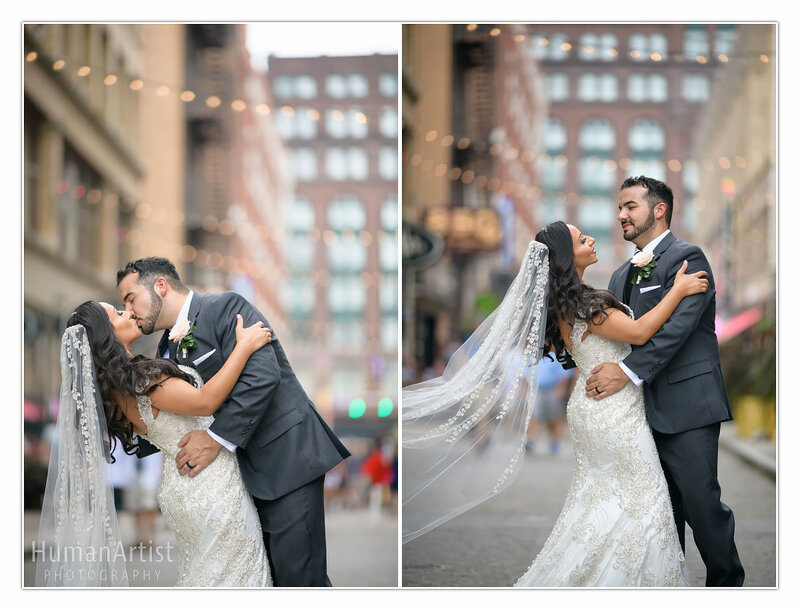 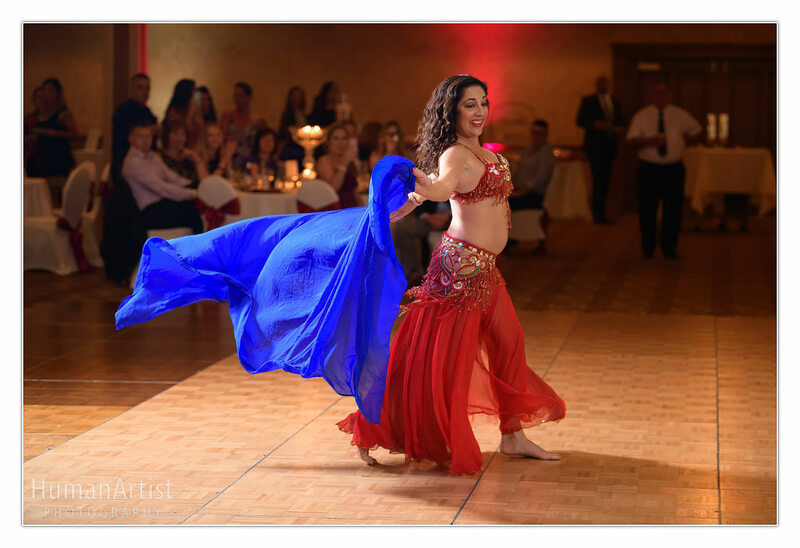 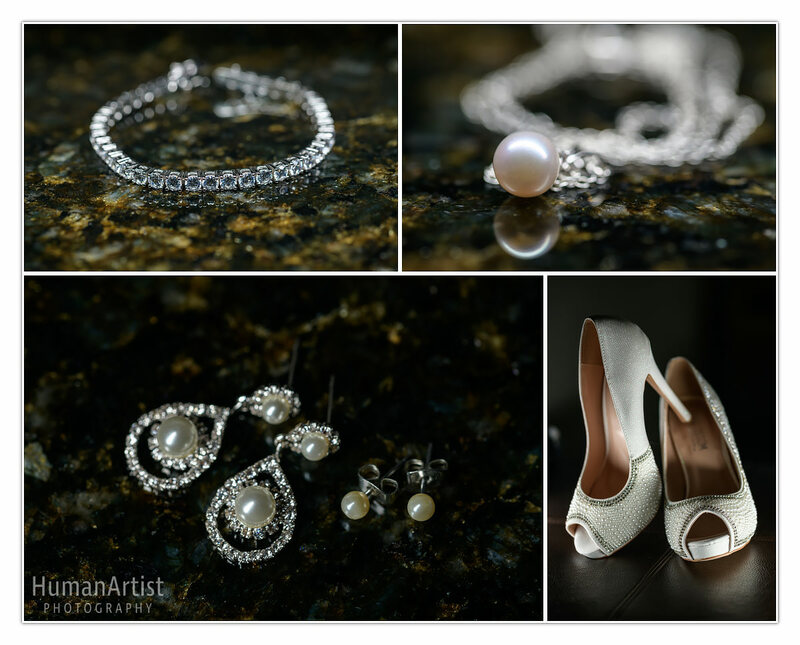 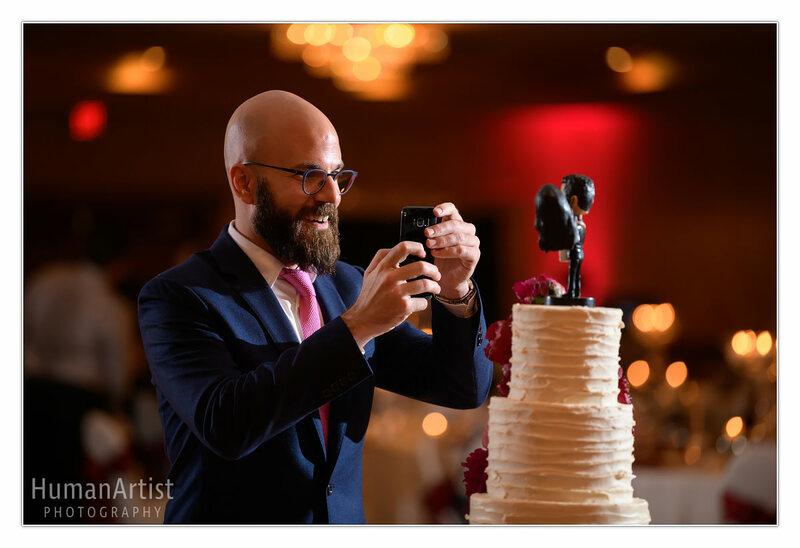 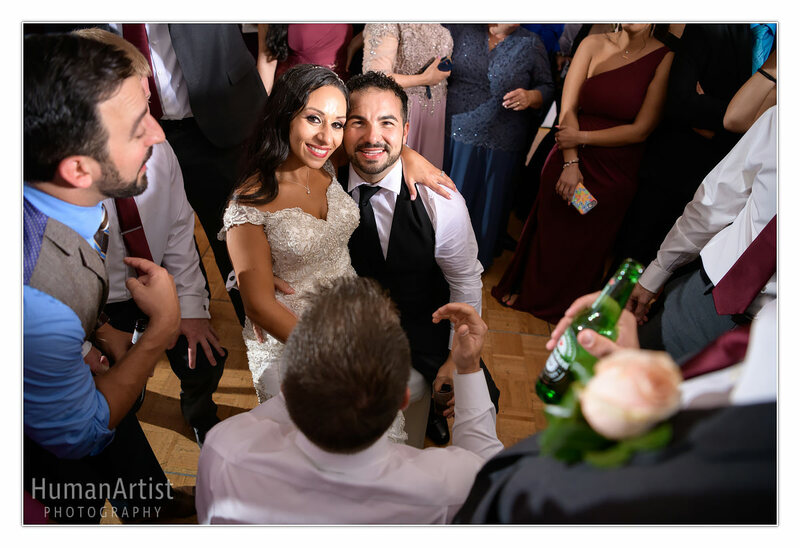 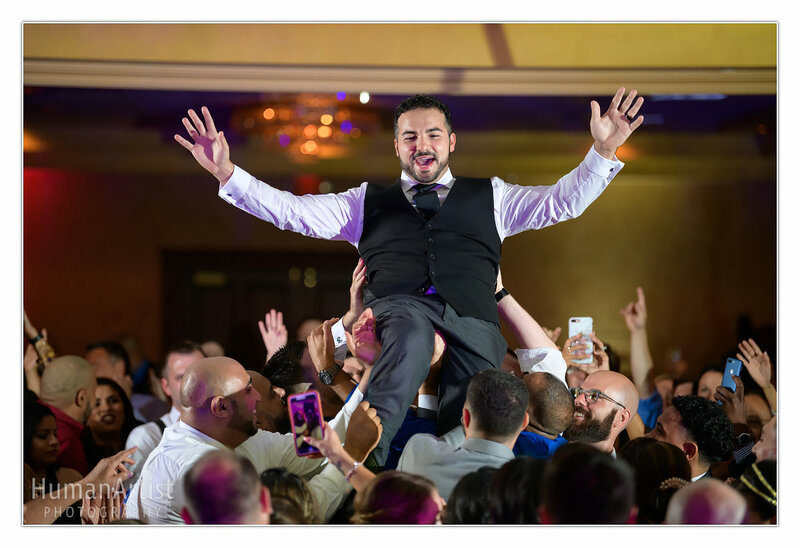 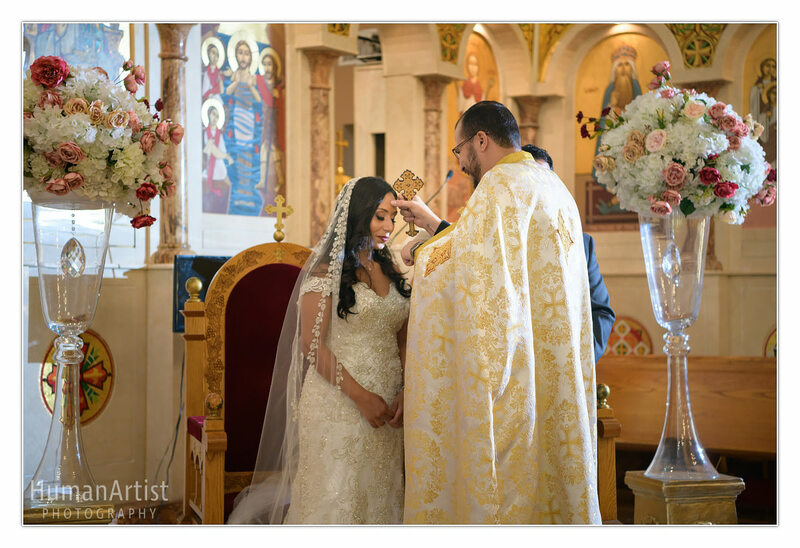 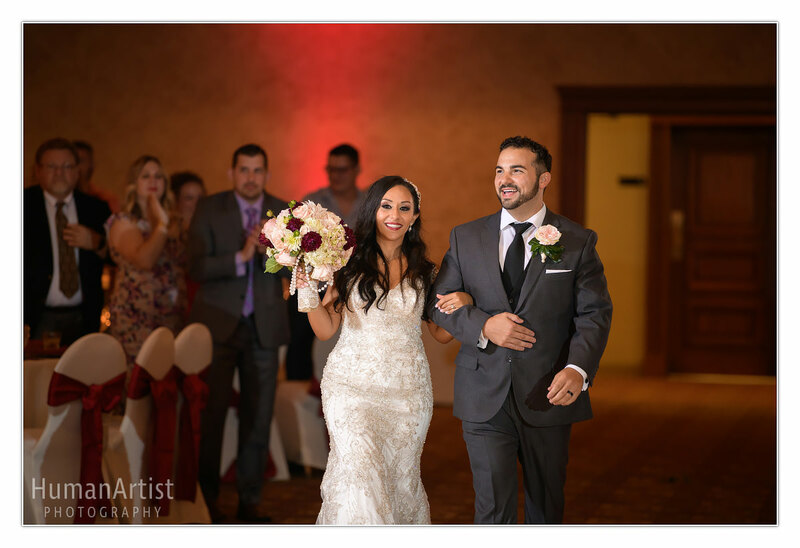 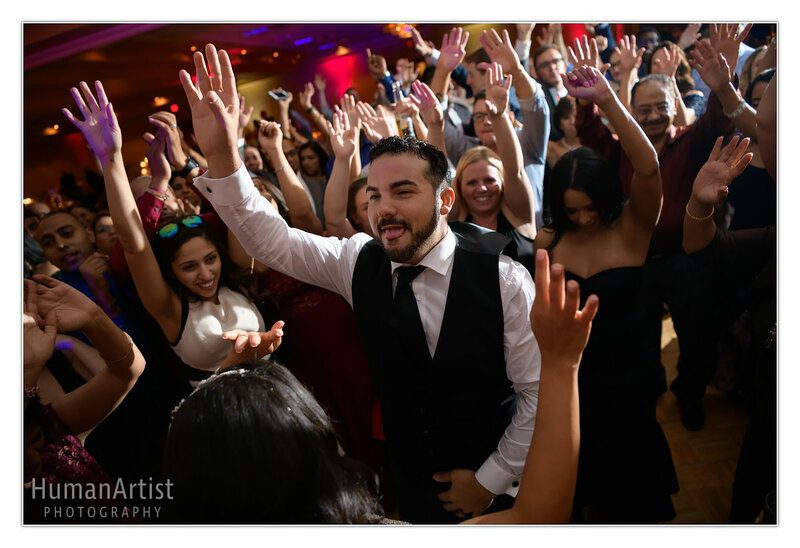 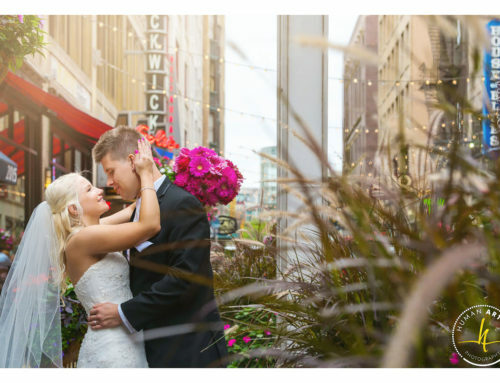 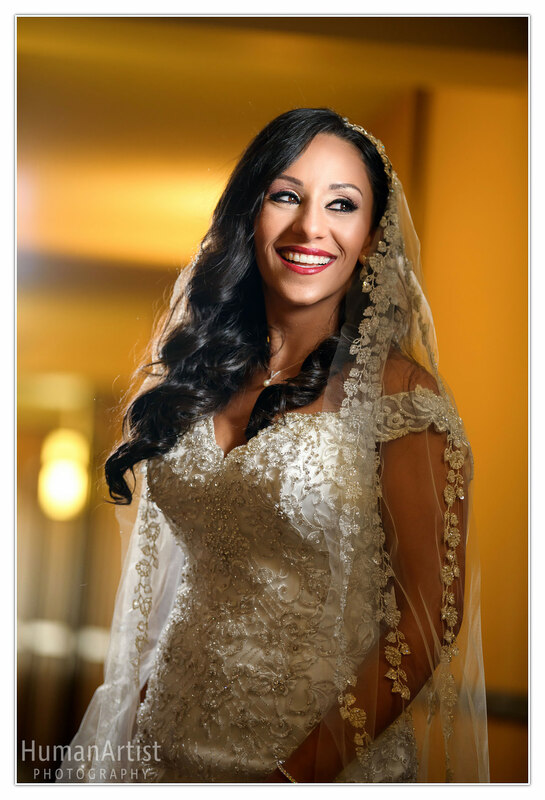 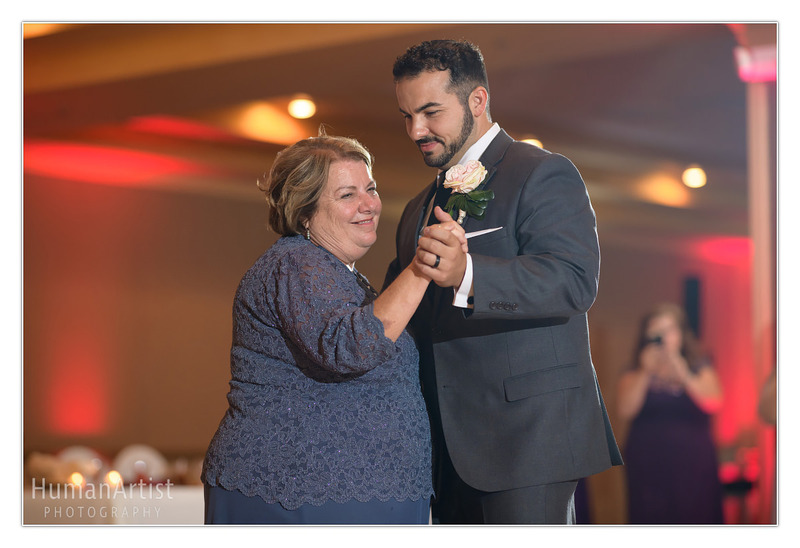 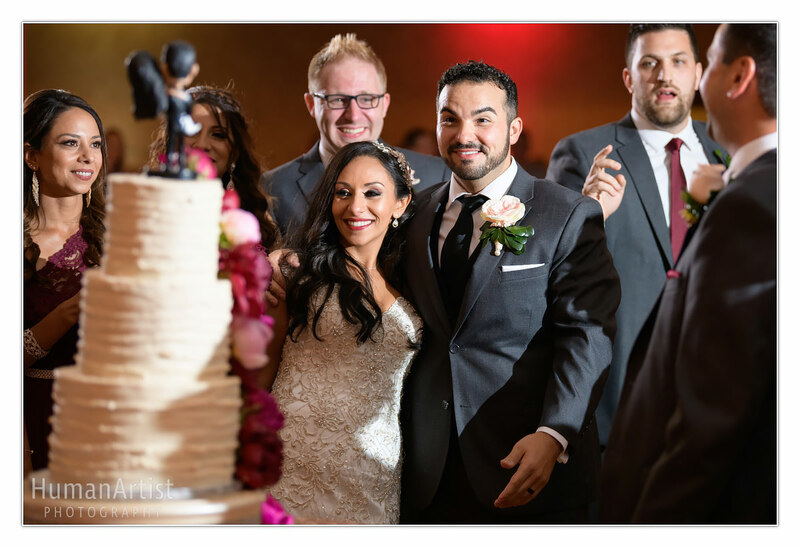 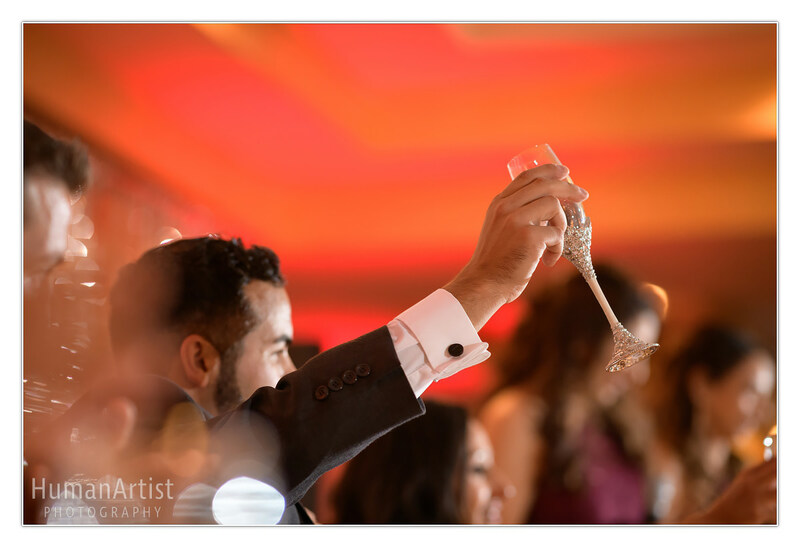 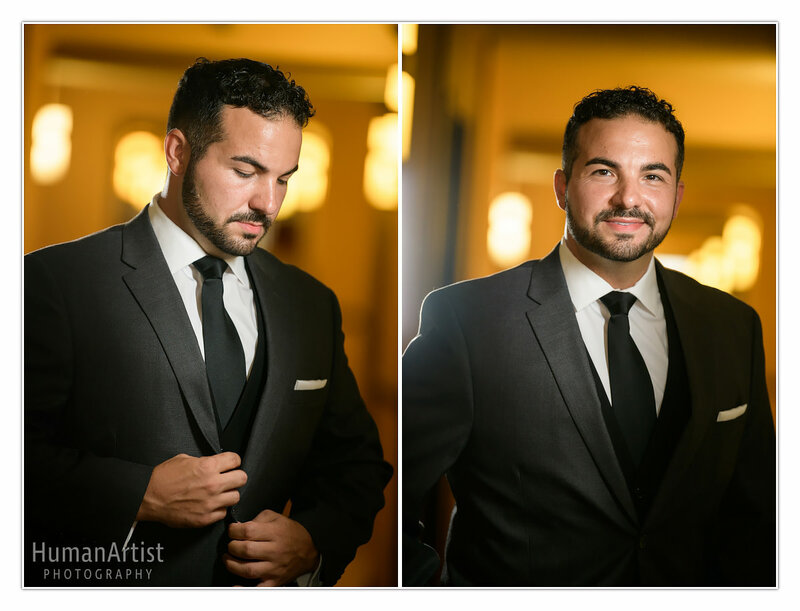 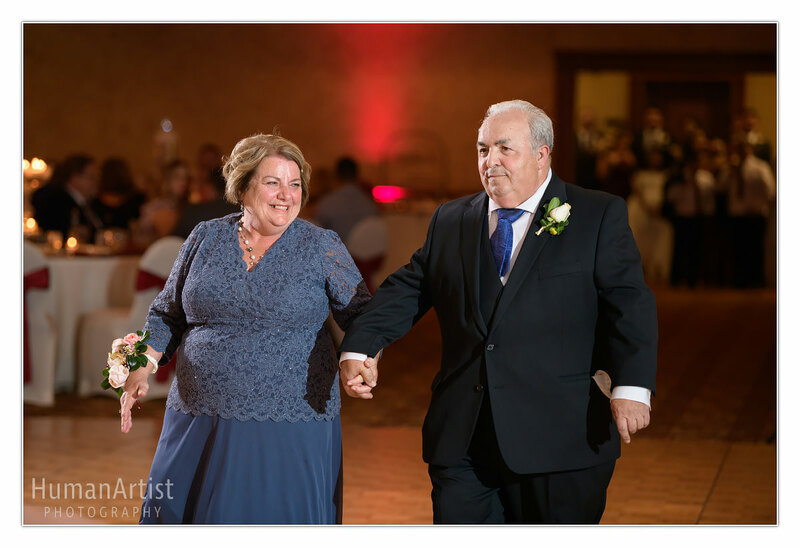 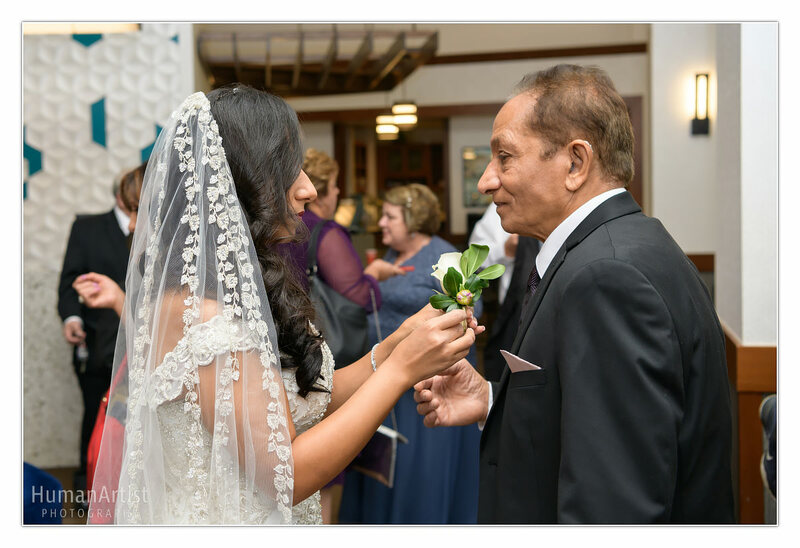 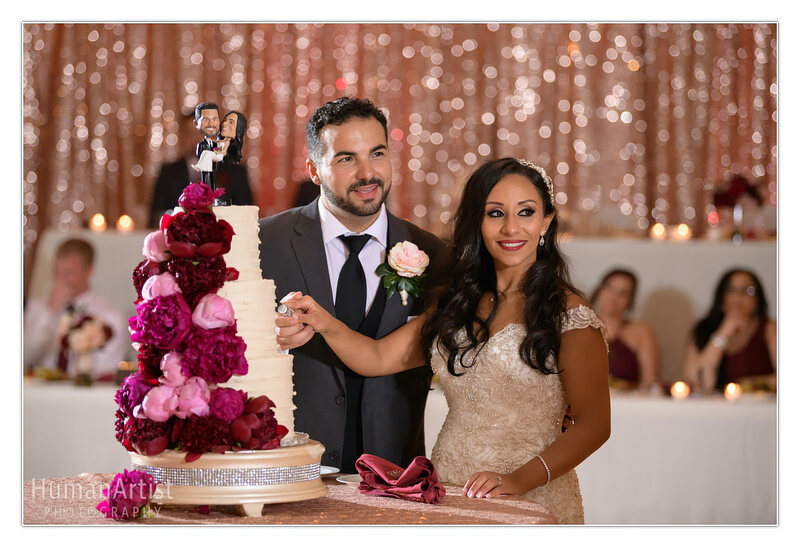 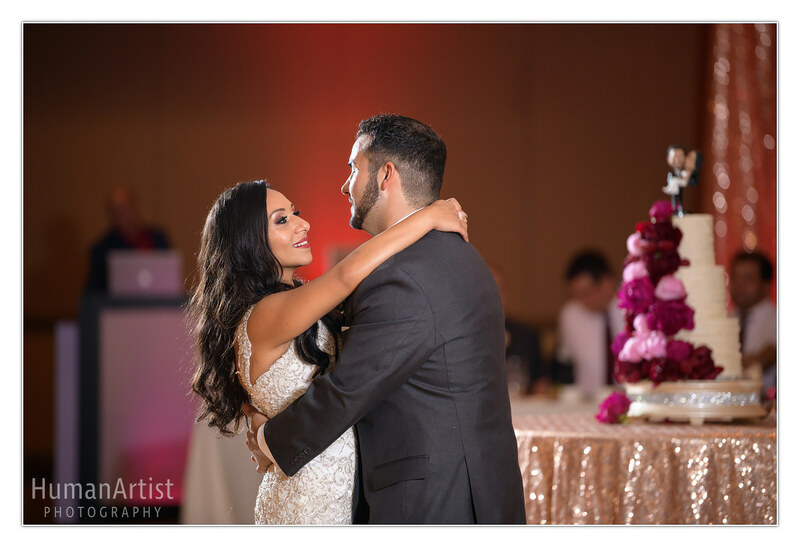 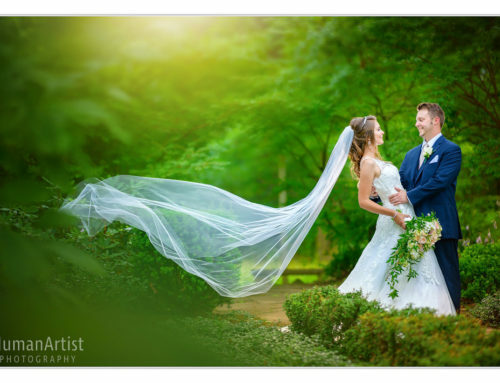 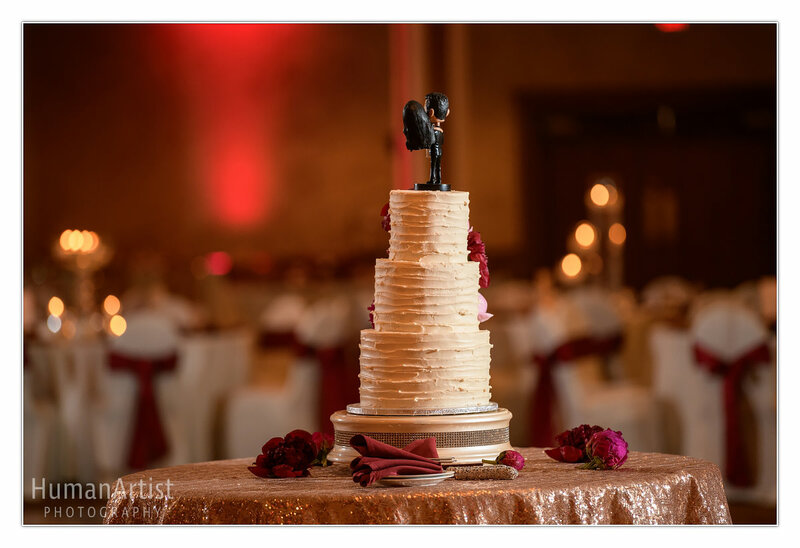 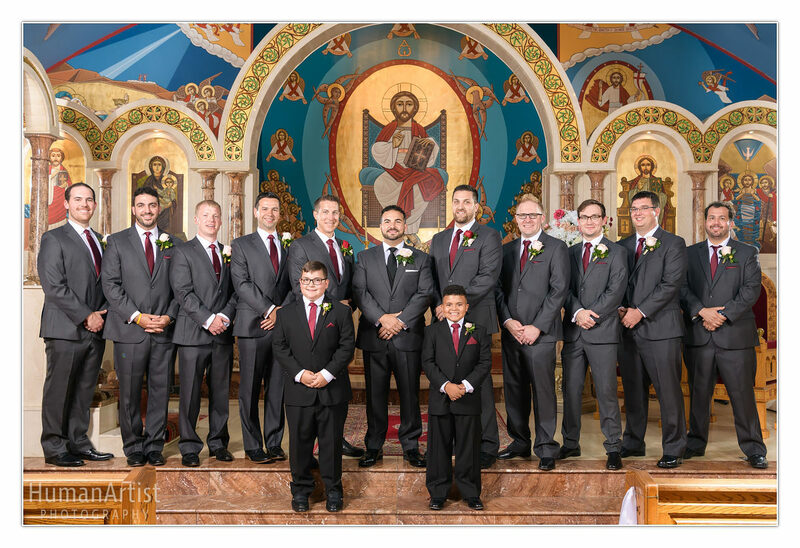 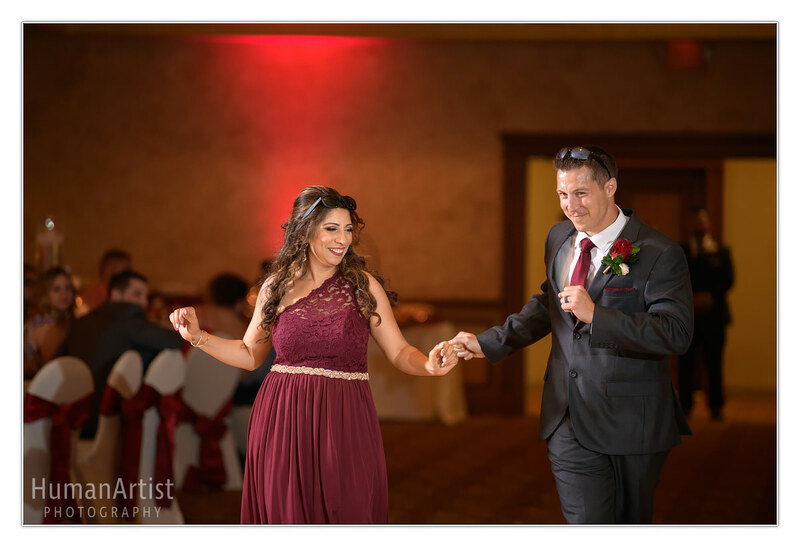 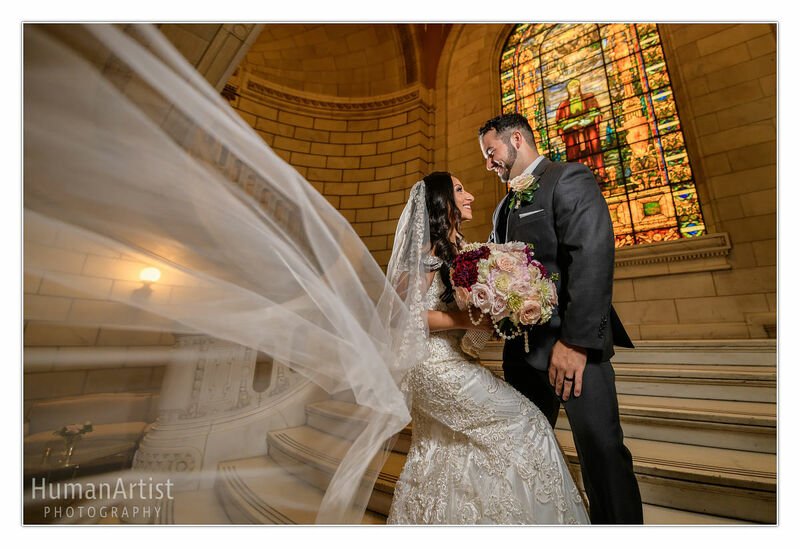 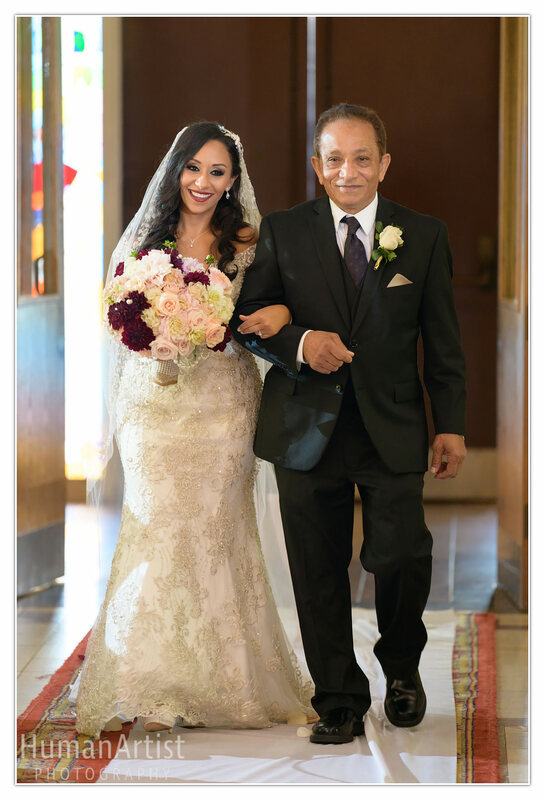 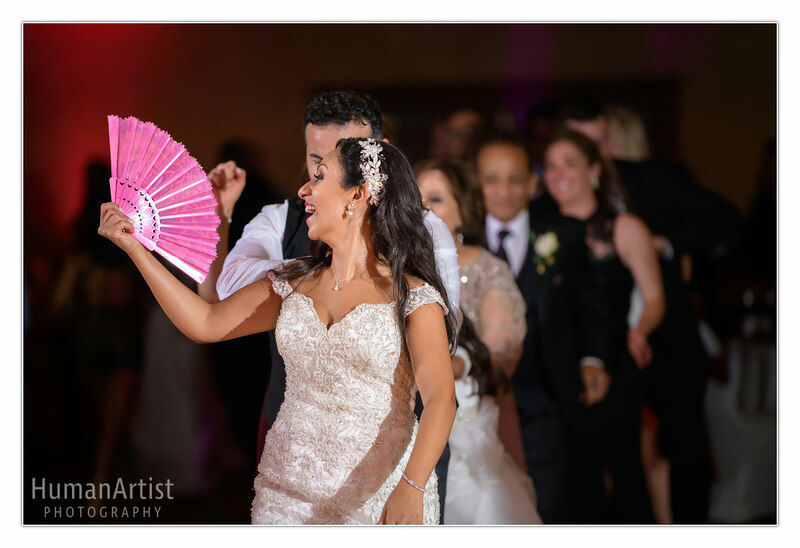 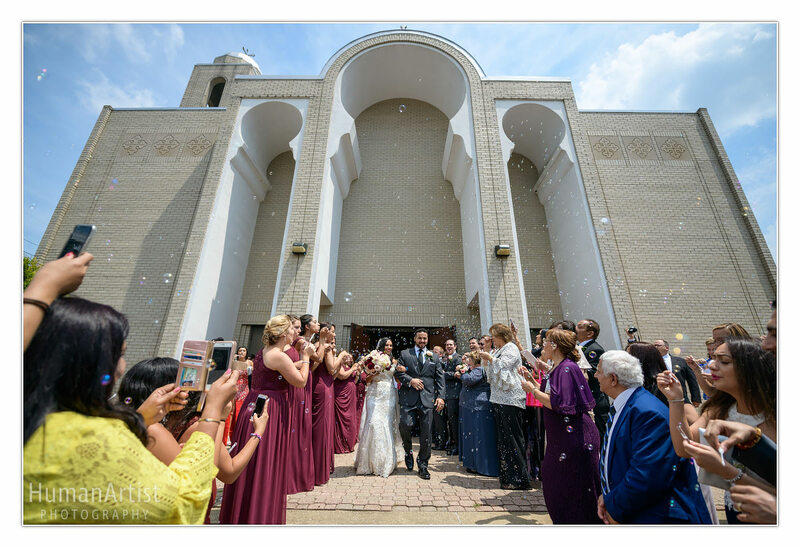 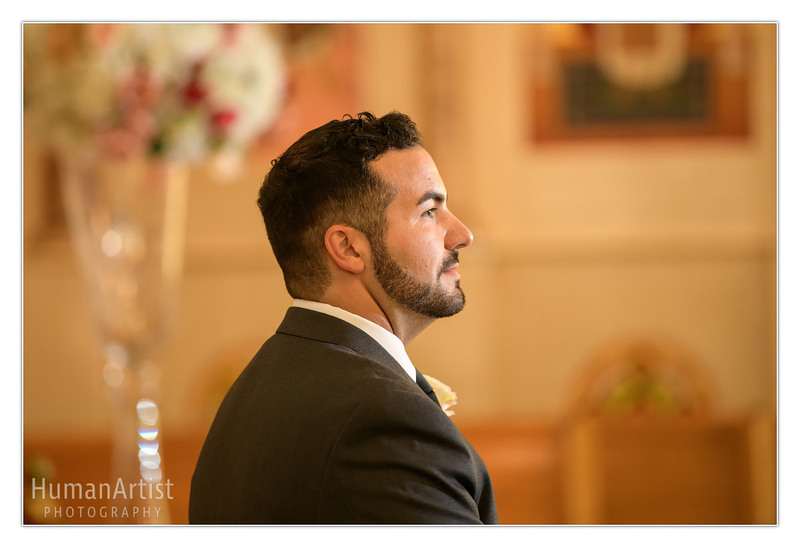 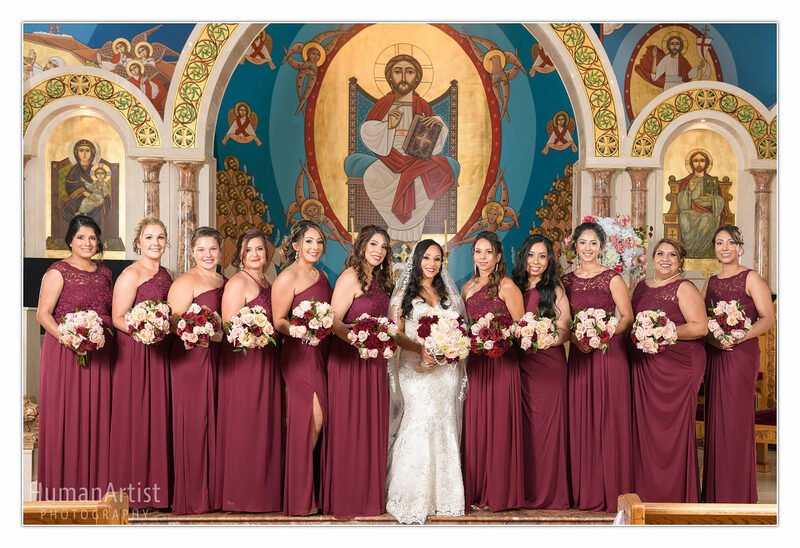 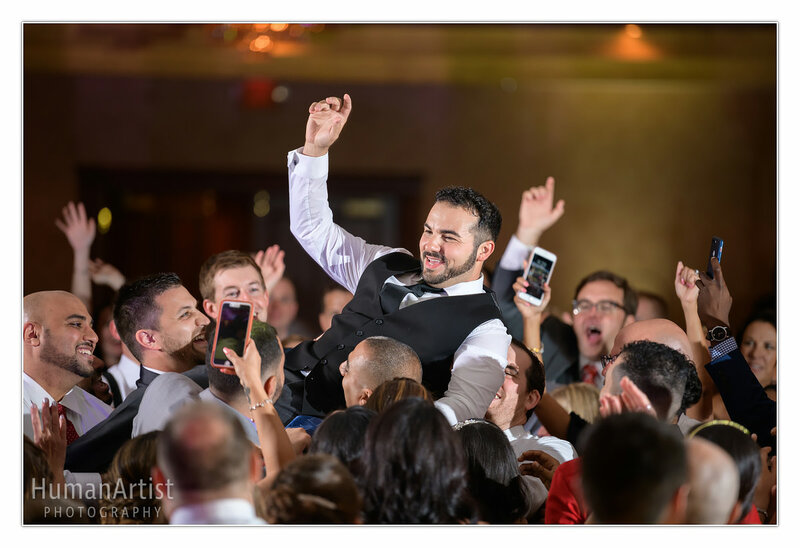 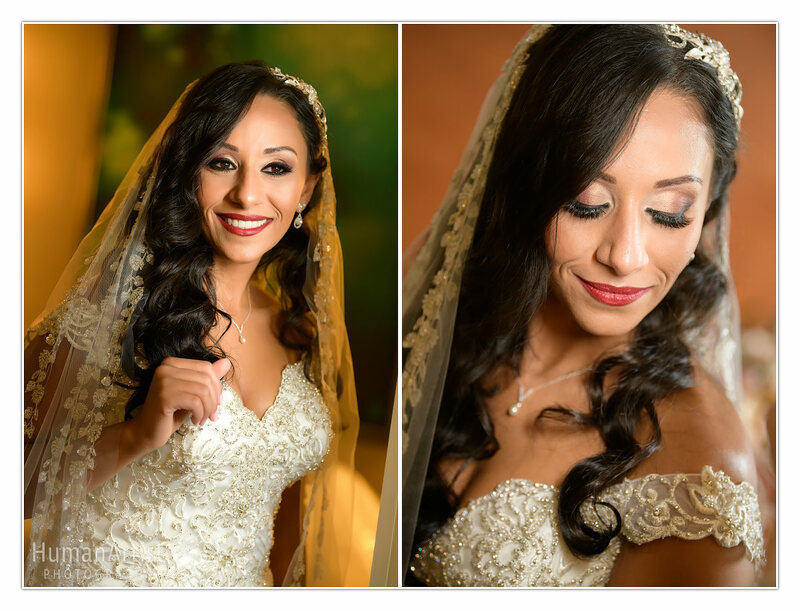 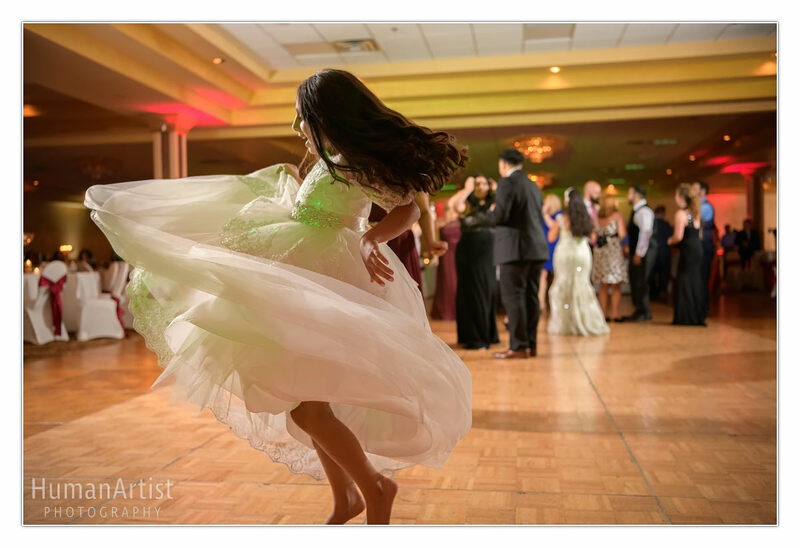 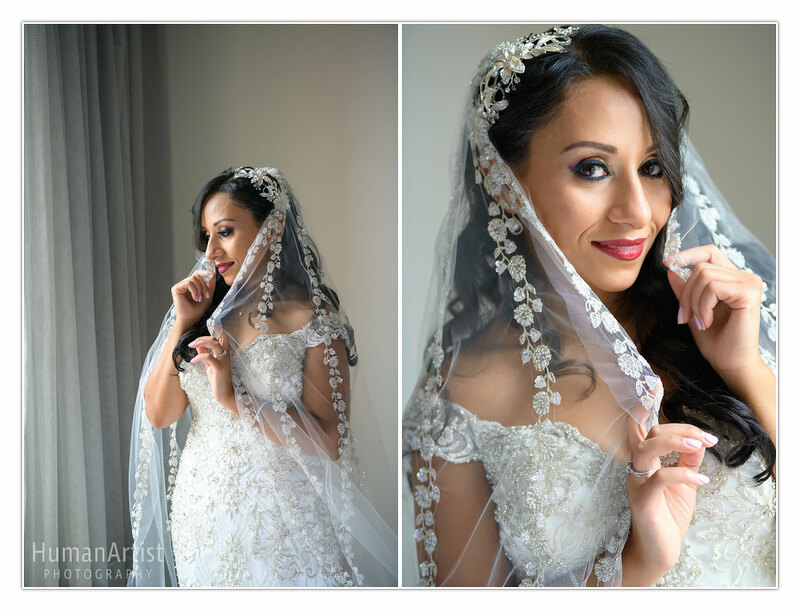 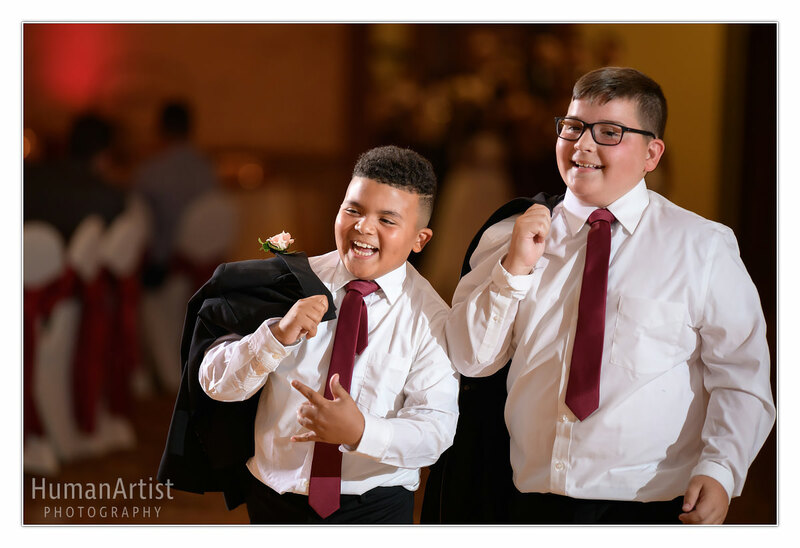 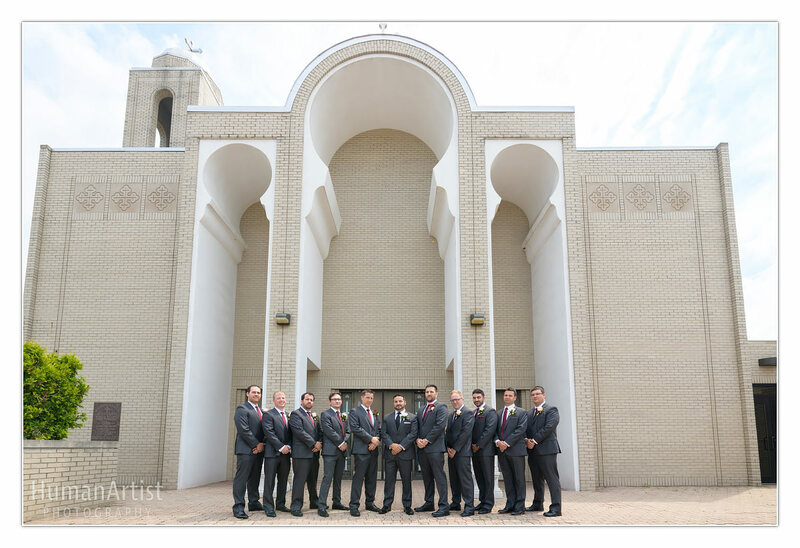 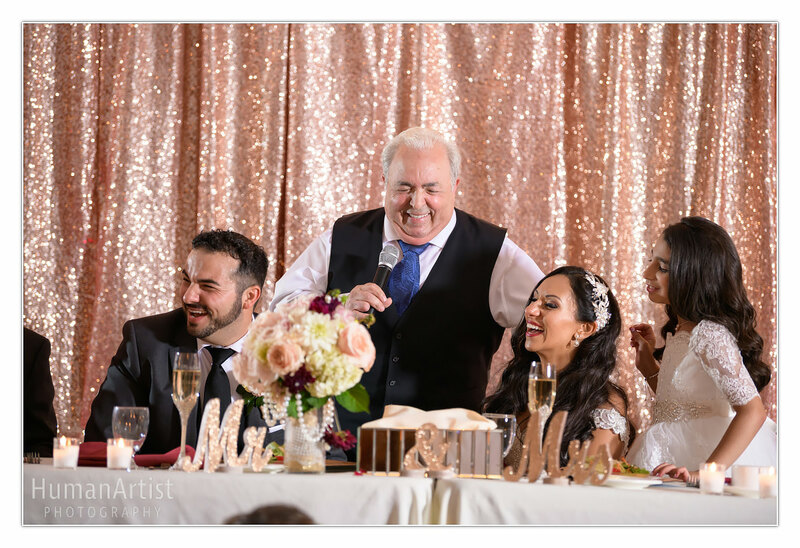 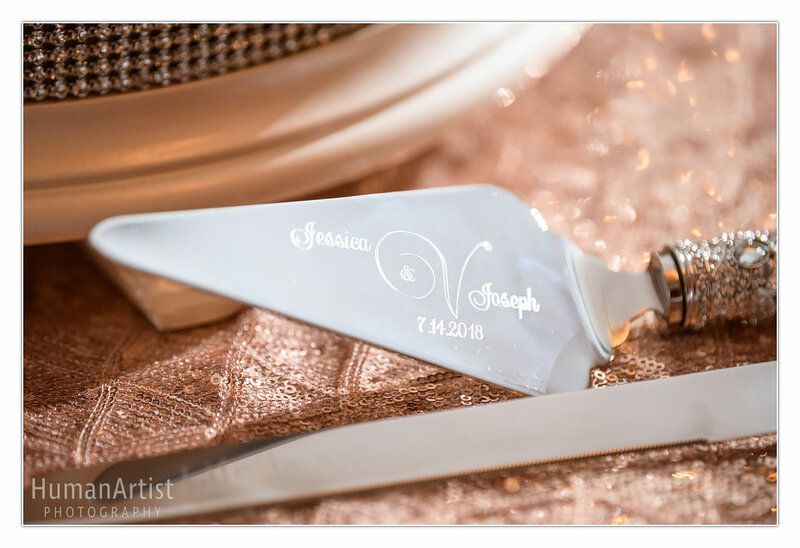 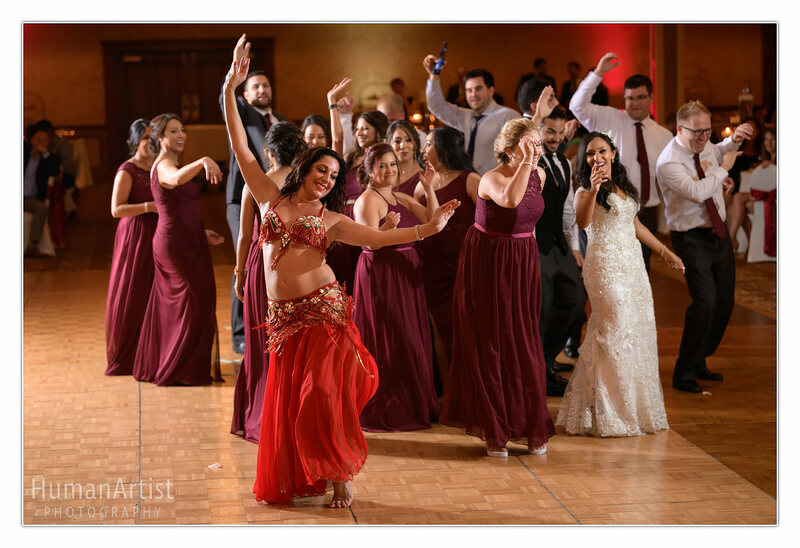 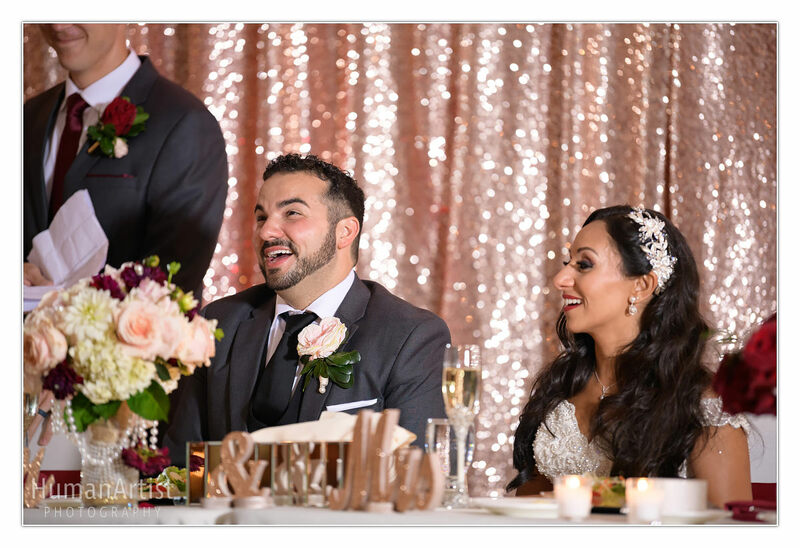 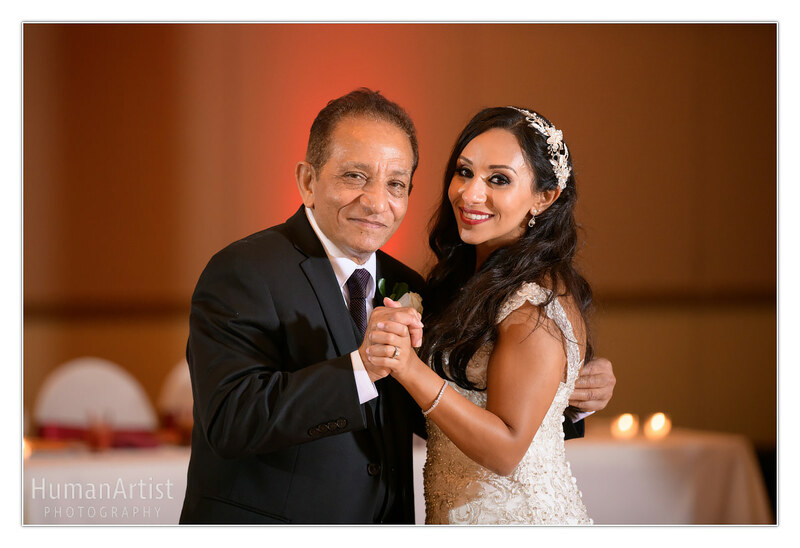 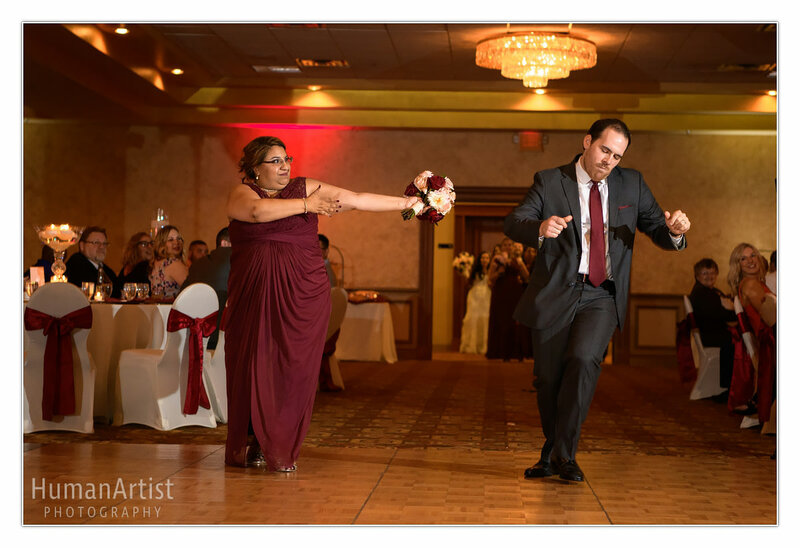 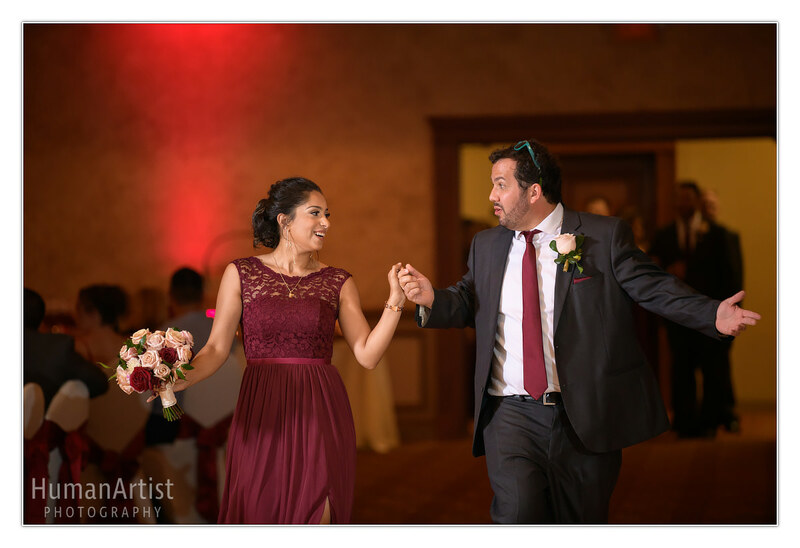 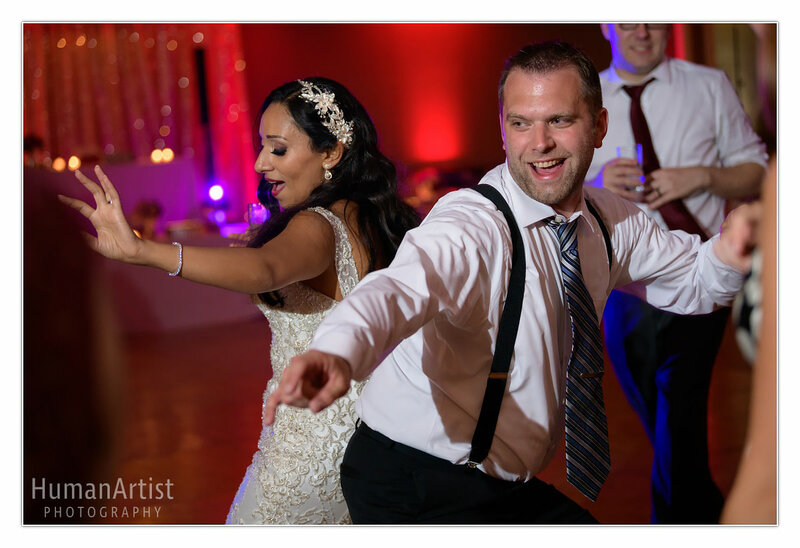 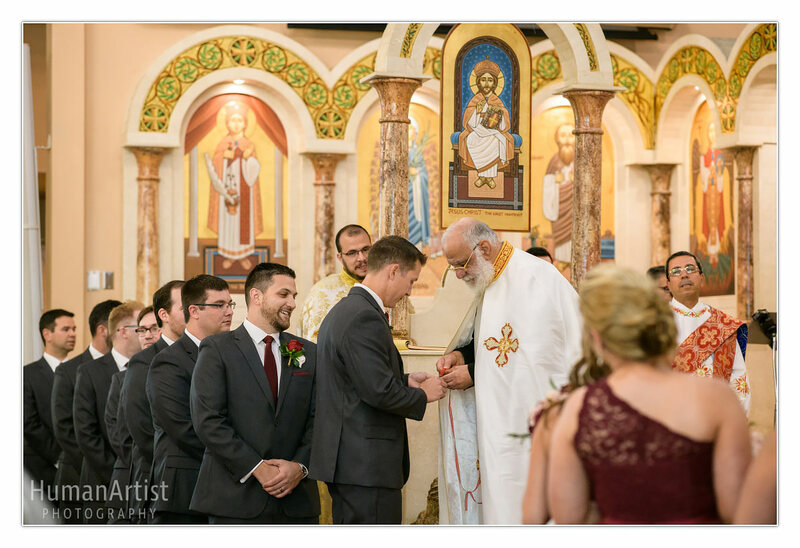 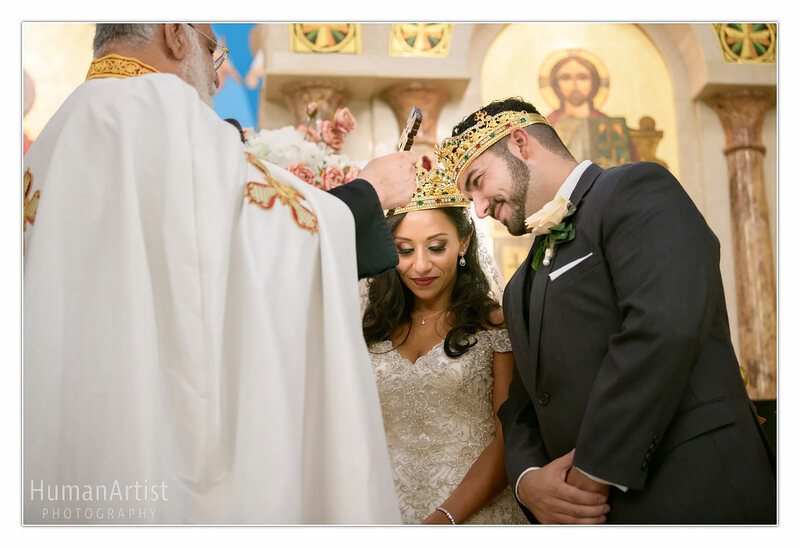 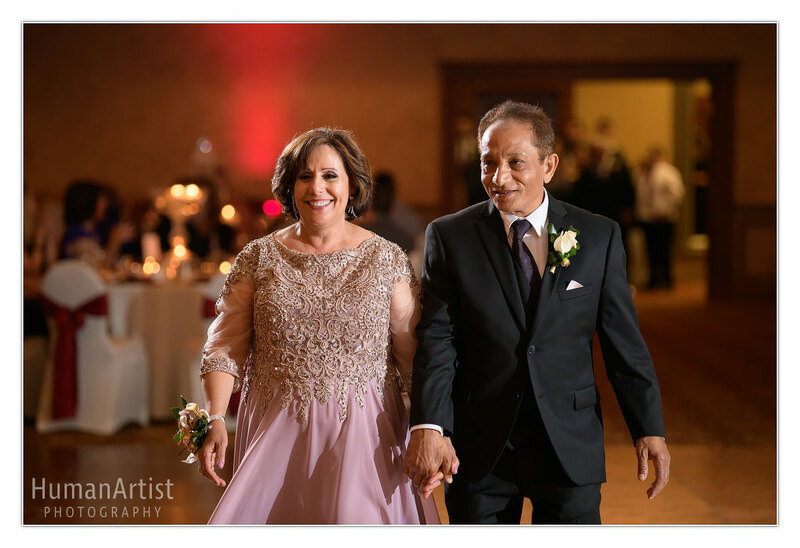 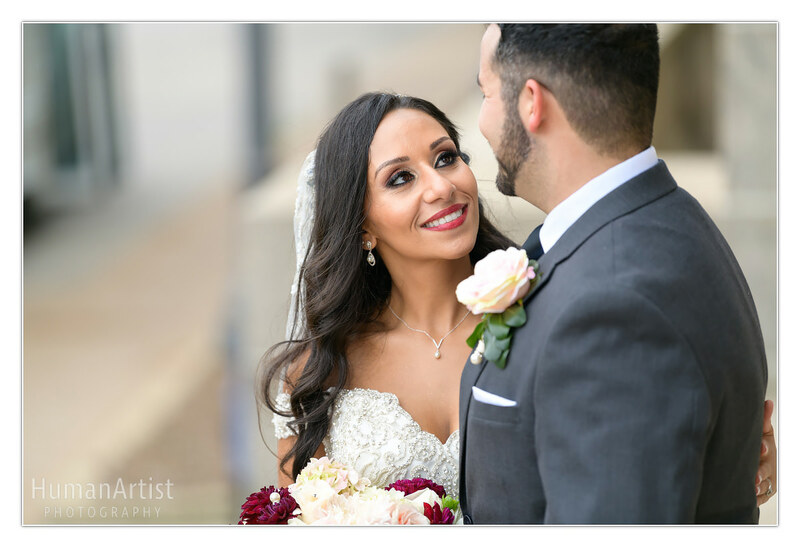 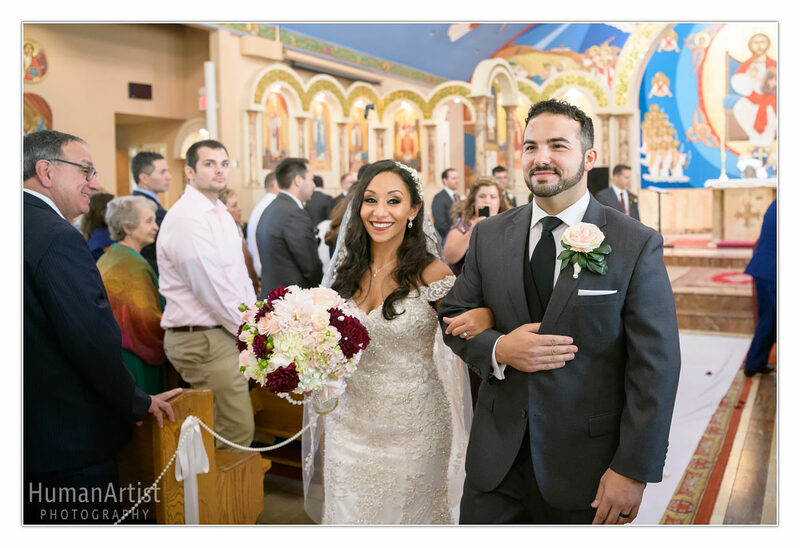 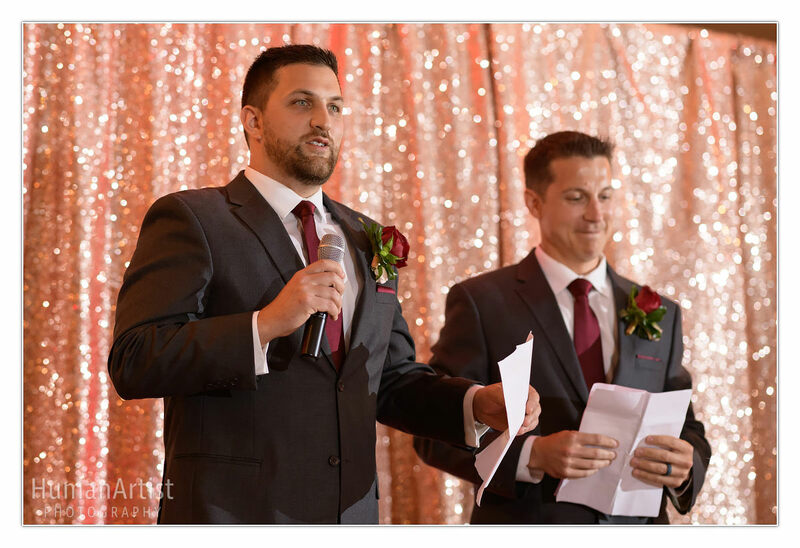 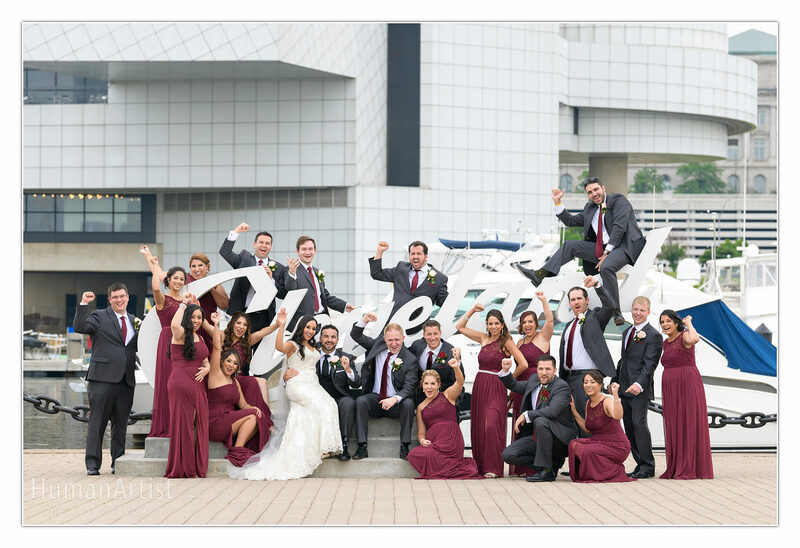 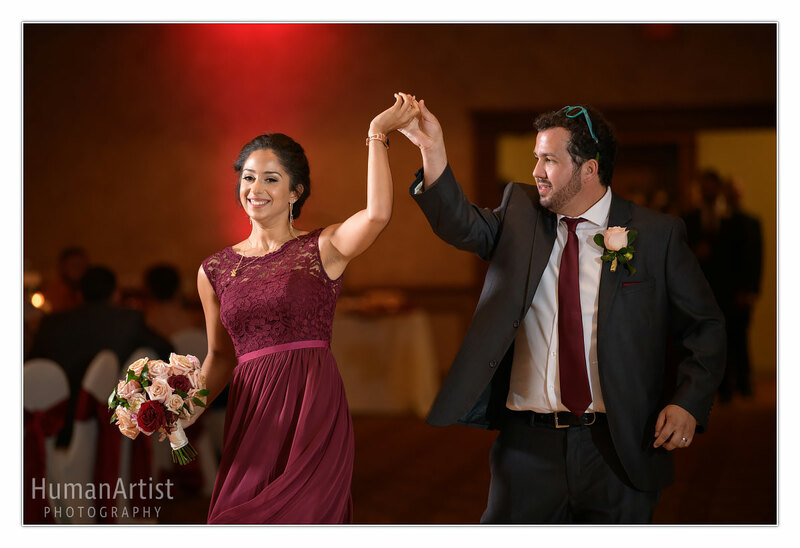 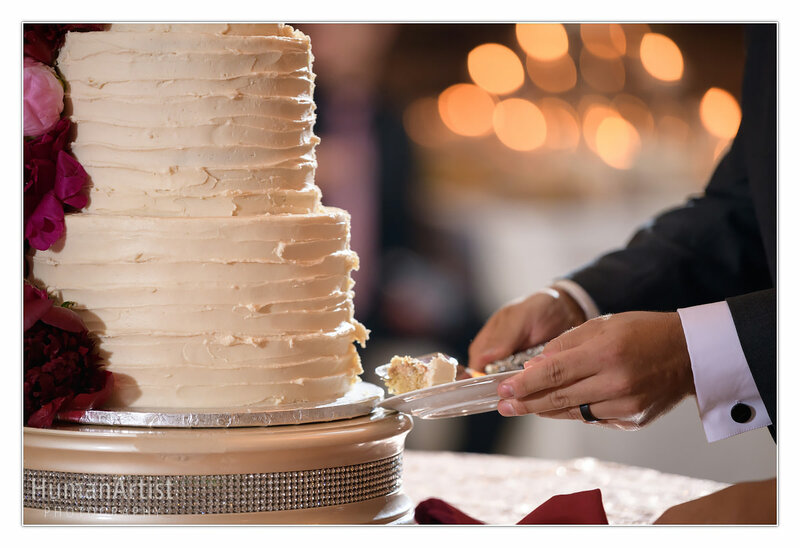 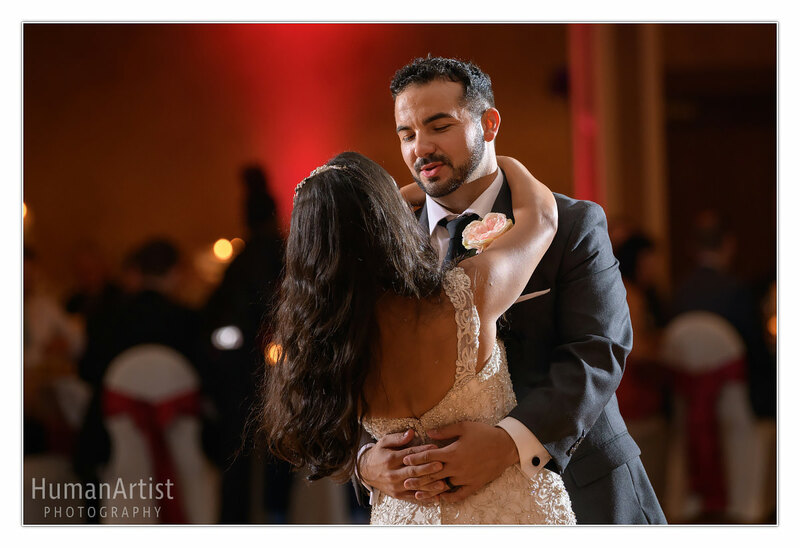 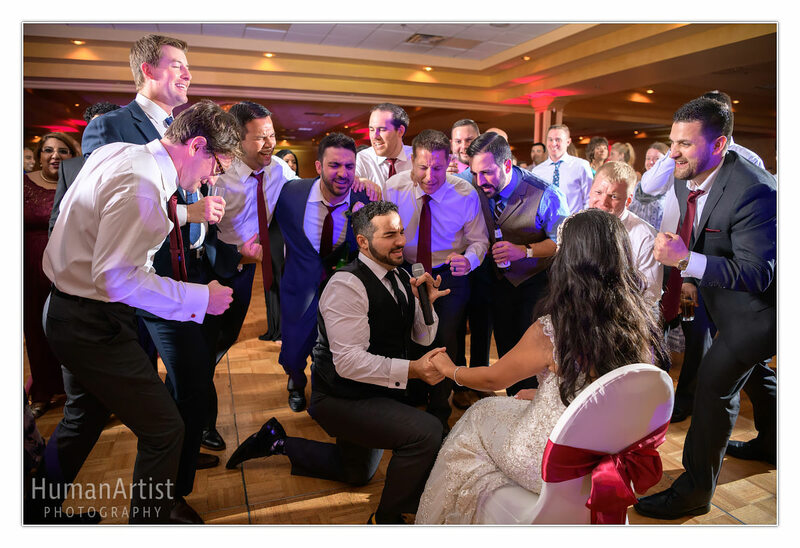 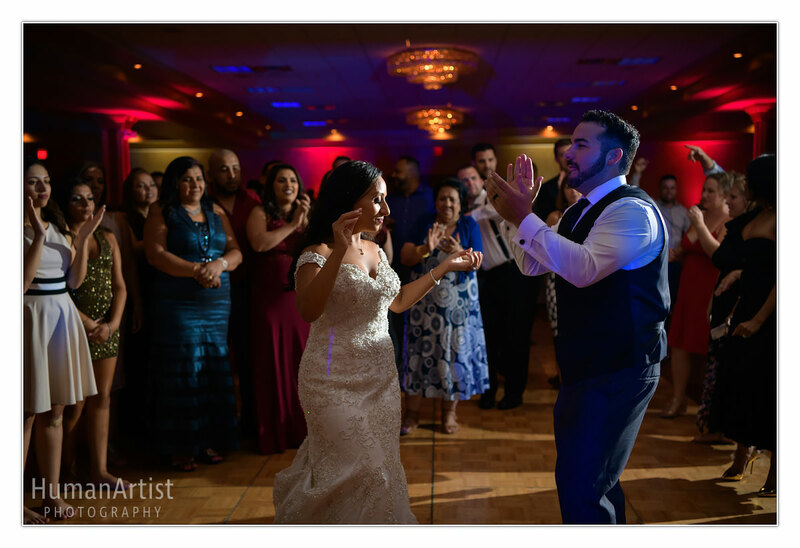 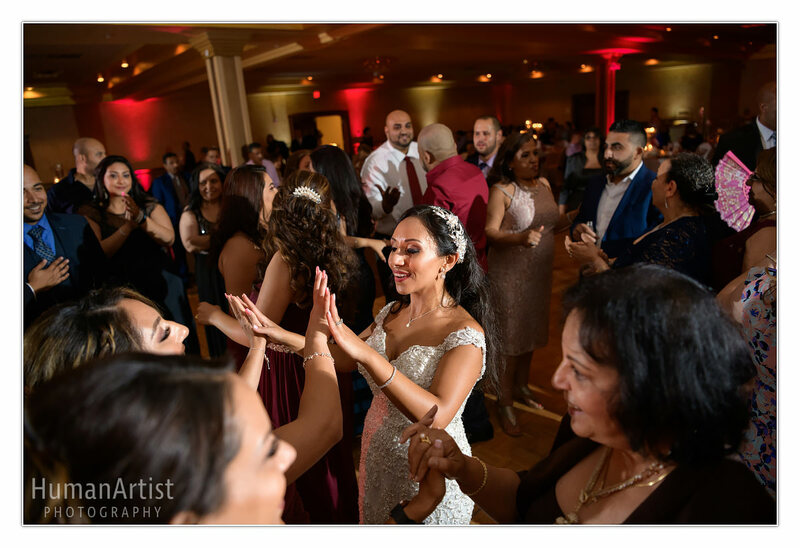 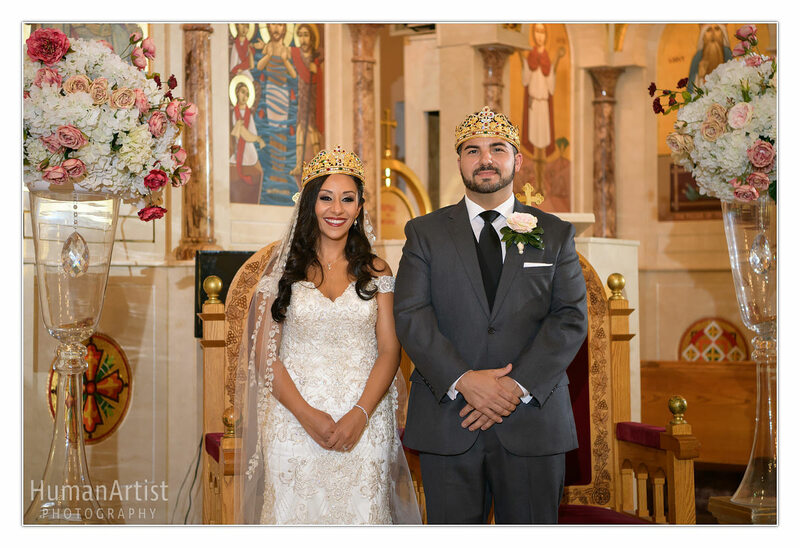 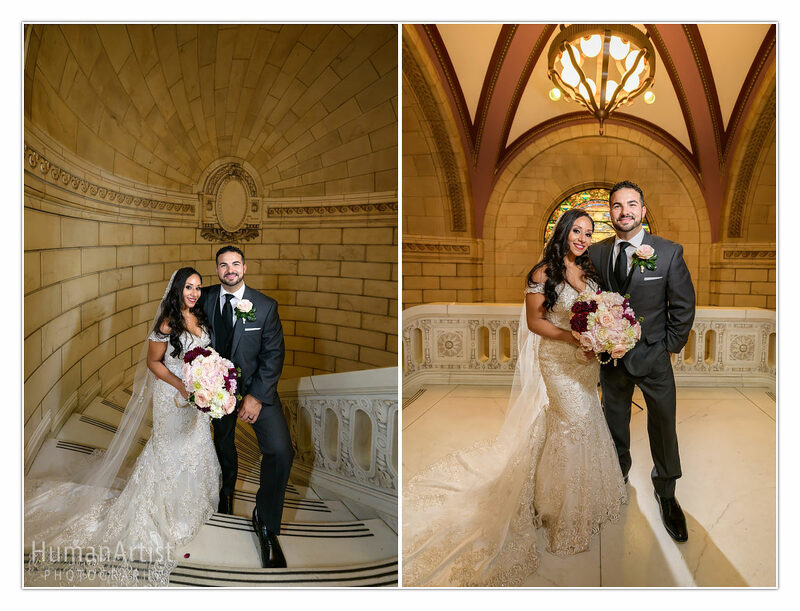 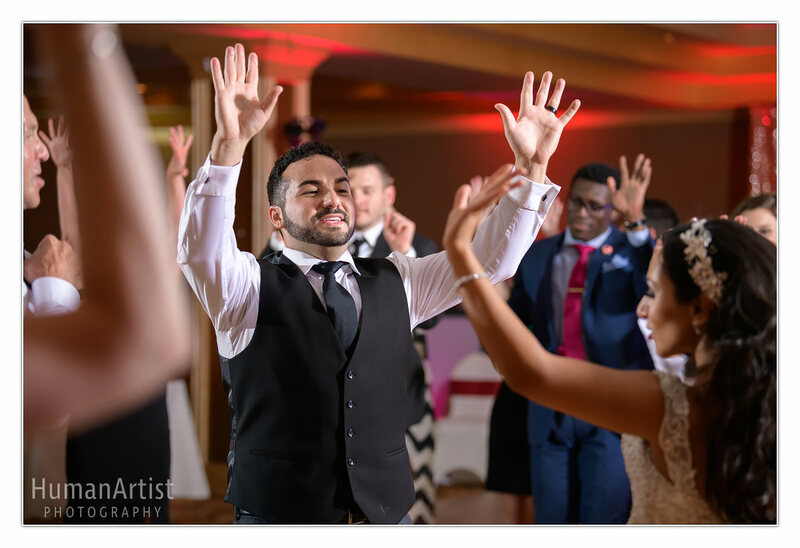 When you pair all the beauty and brilliance of an Egyptian celebration with the joy and charisma of a big Italian festa, you have Jessica and Joseph’s unforgettable wedding day in Cleveland, Ohio. 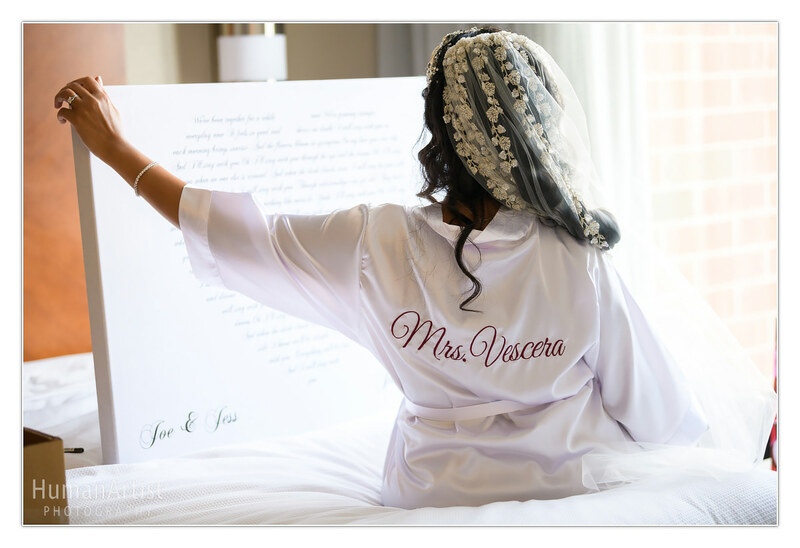 We arrived at the Hyatt Place in Independence for getting-ready photos to find a frenzy of hard work happening in Jessica’s bridal suite! 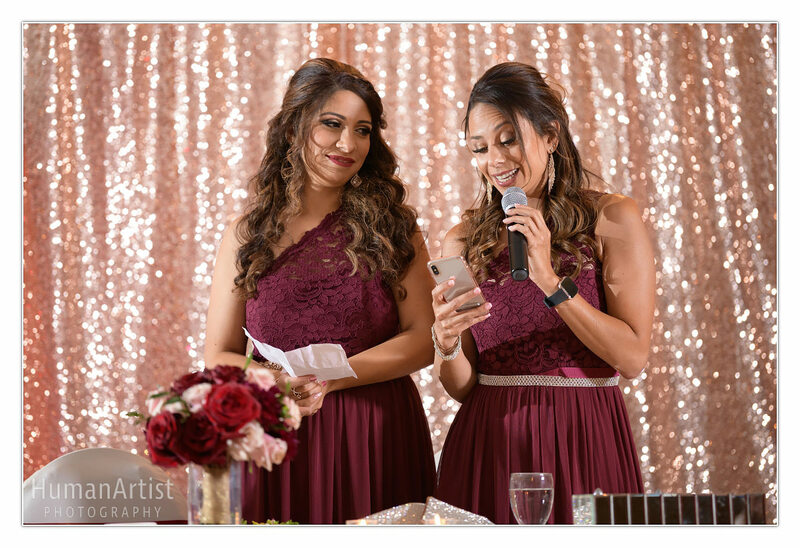 Nearly 20 freshly made-up bridesmaids, friends, and family members were wrapping up their finishing touches in all corners of the room. 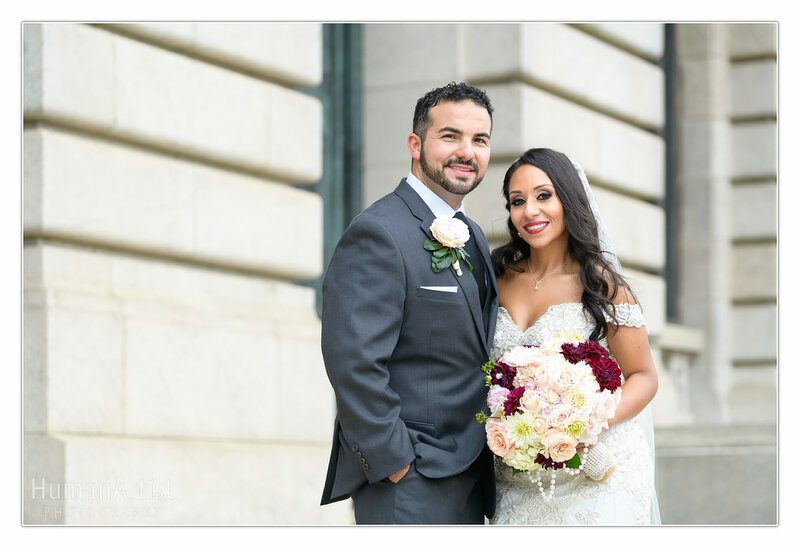 Any remaining space was occupied by gorgeous bouquets and boutonnieres from Farah & Nour LLC. 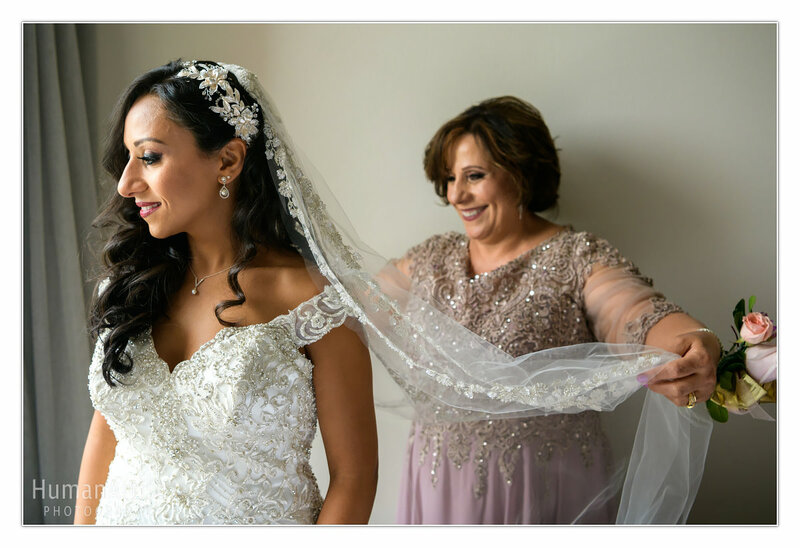 We could immediately feel the energy and support of those closest to Jessica, including her groom’s sweet mother, who stopped by to see the radiant bride-to-be. 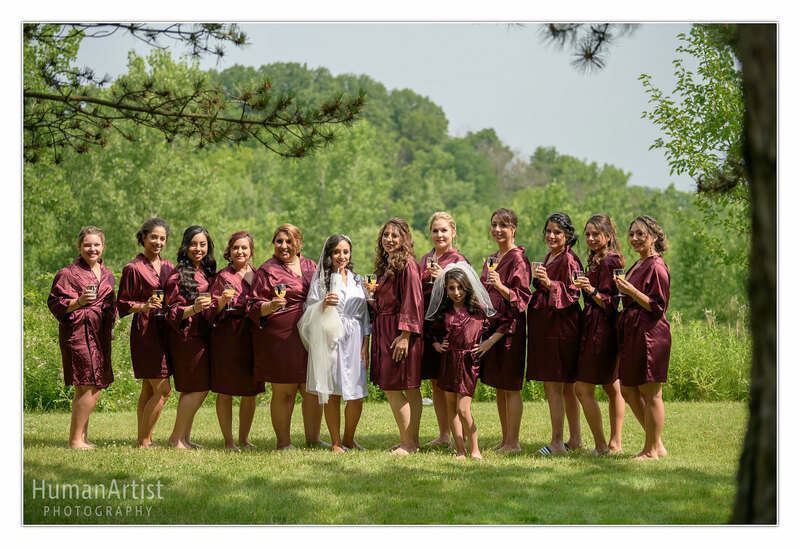 After we stepped outside with all of Jessica’s ladies for a group photo in their matching robes, we caught a few sweet moments with the bride, who was ready to open her wedding day gift from Joseph. 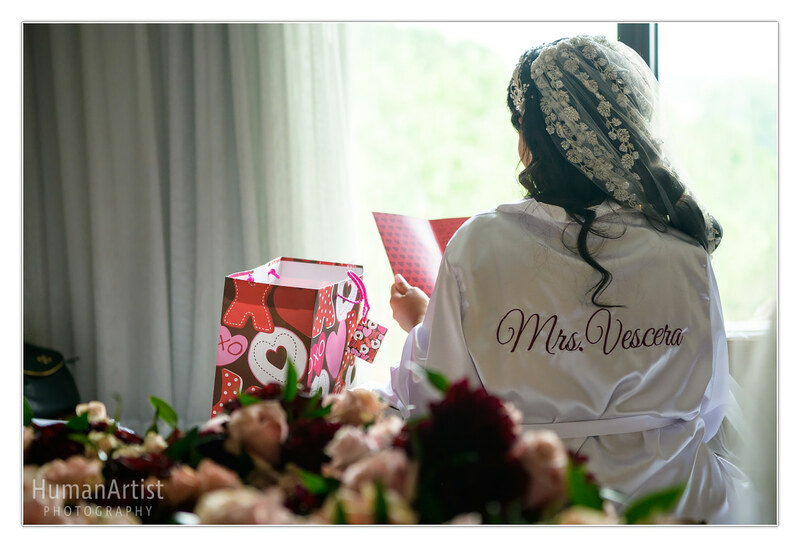 Along with a big bag of chocolates and adorable Aladdin and Abu Pop! 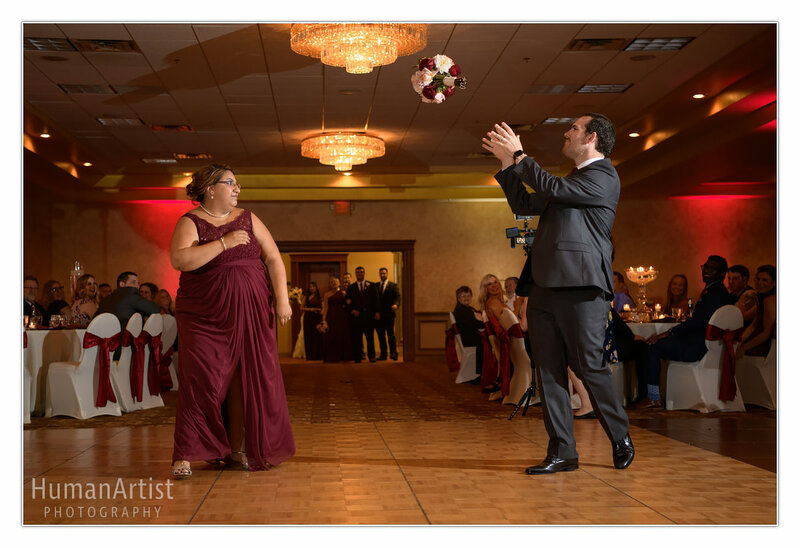 toys, Joseph delivered a huge canvas wrap, featuring the words of John Legend’s “Stay with You” in the shape of a heart. 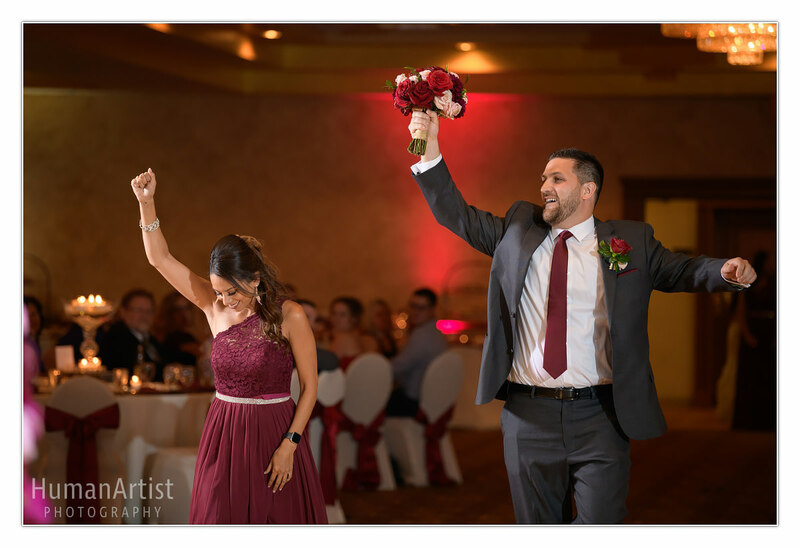 Jessica certainly knew the way to Joseph’s heart—she gifted him with an incredible bottle of Pappy Van Winkle’s Family Reserve bourbon and a custom tumbler from which to enjoy it. 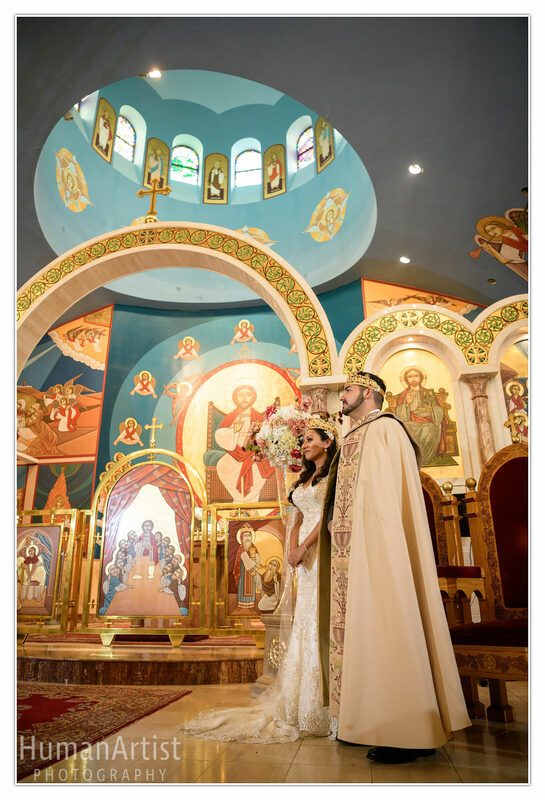 The ornate details of the sanctuary at St. Mark’s Coptic Orthodox Church were majestic. 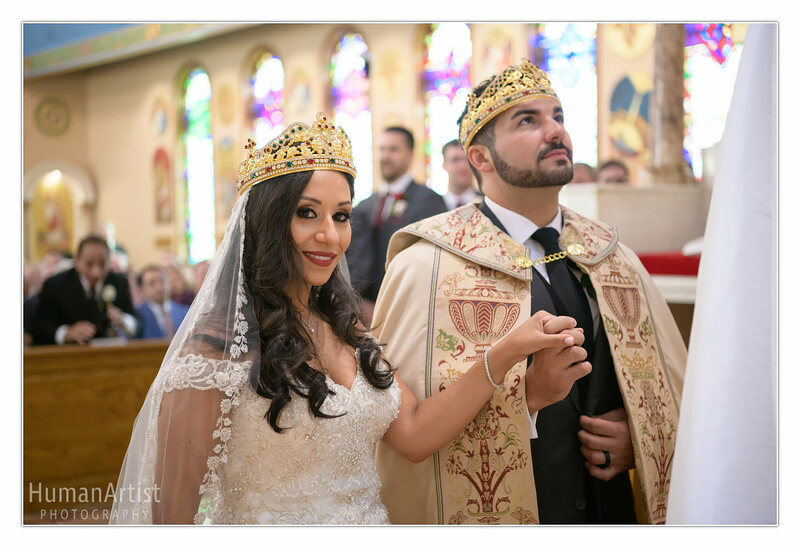 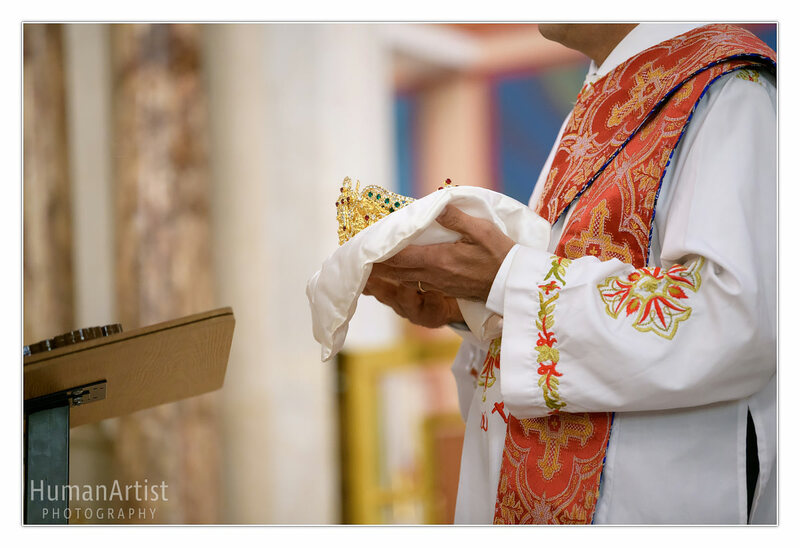 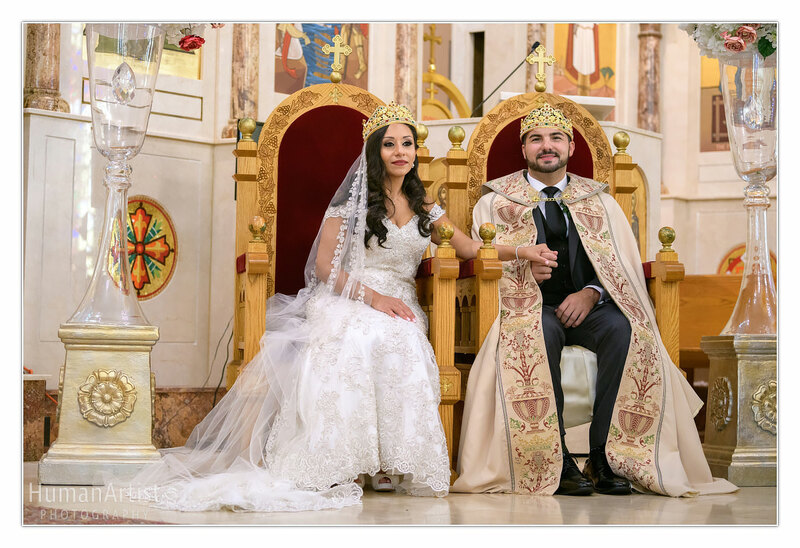 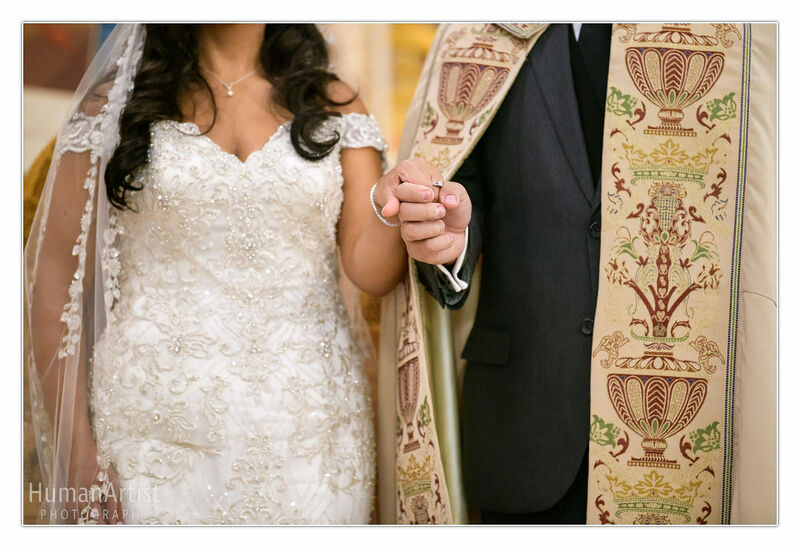 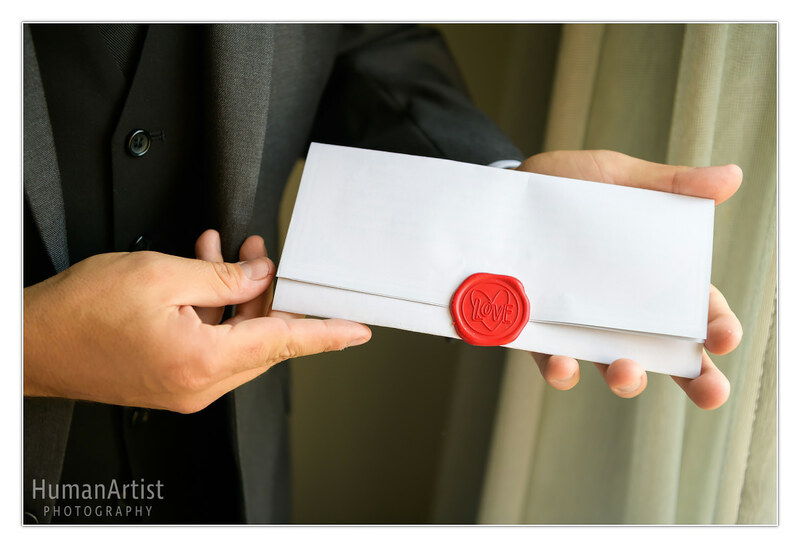 As Jessica and Joseph were crowned queen and king of their household, one could not help but be struck by the very special outward symbolism of their sacred vows. 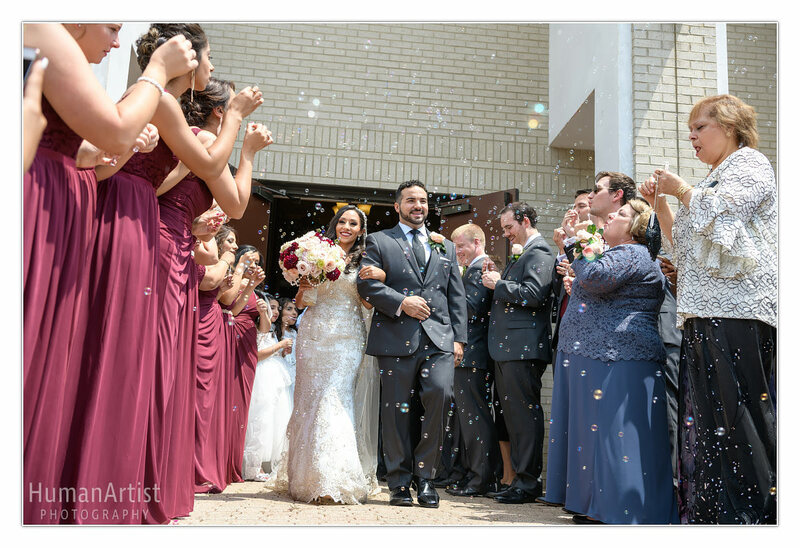 There were lots of happy tears, the joyful raising of voices, and so much love resonating throughout the church. 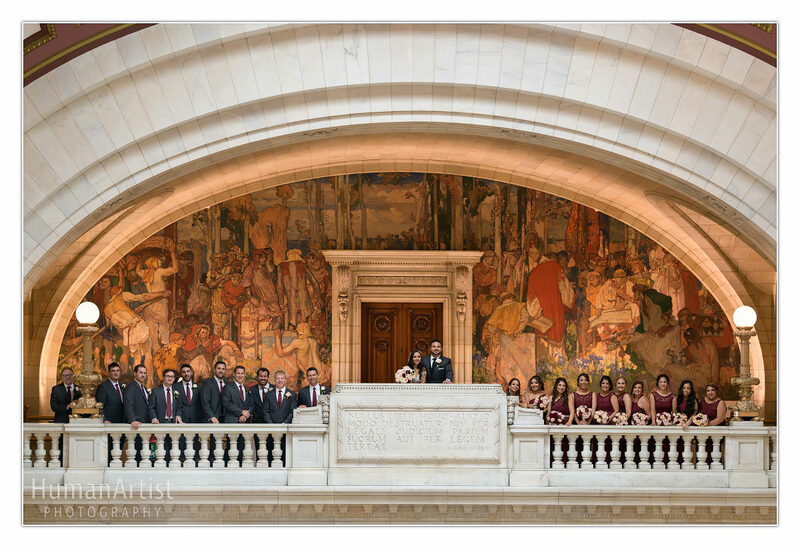 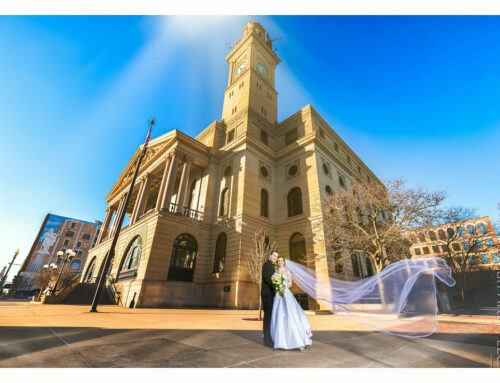 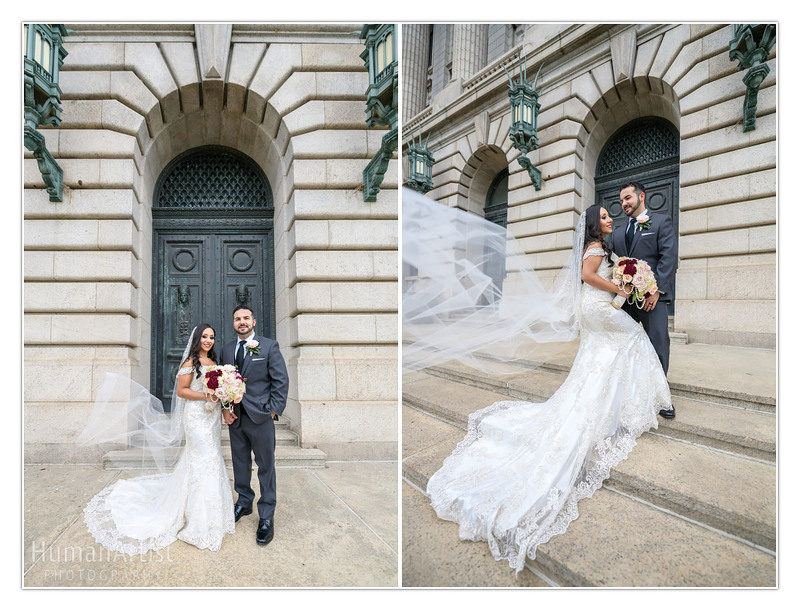 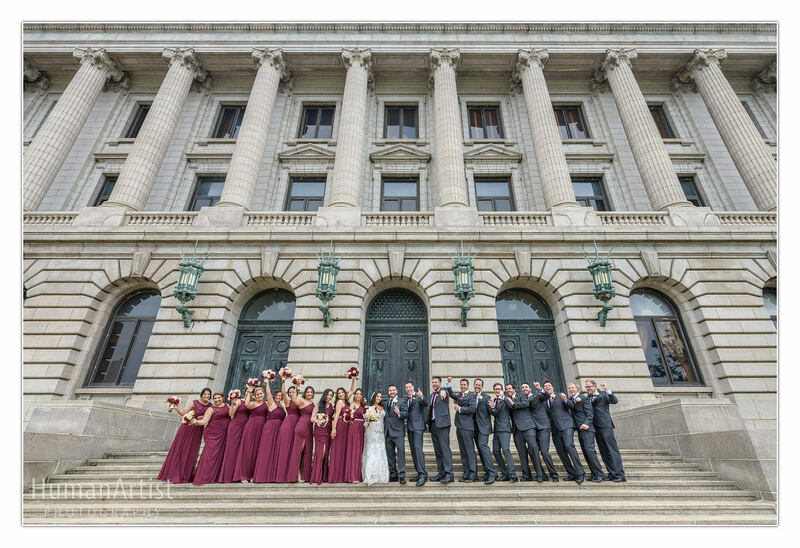 Following a bubble exit and family portraits, the bridal party was off to the Cleveland Courthouse in downtown for a quick formal photo session! 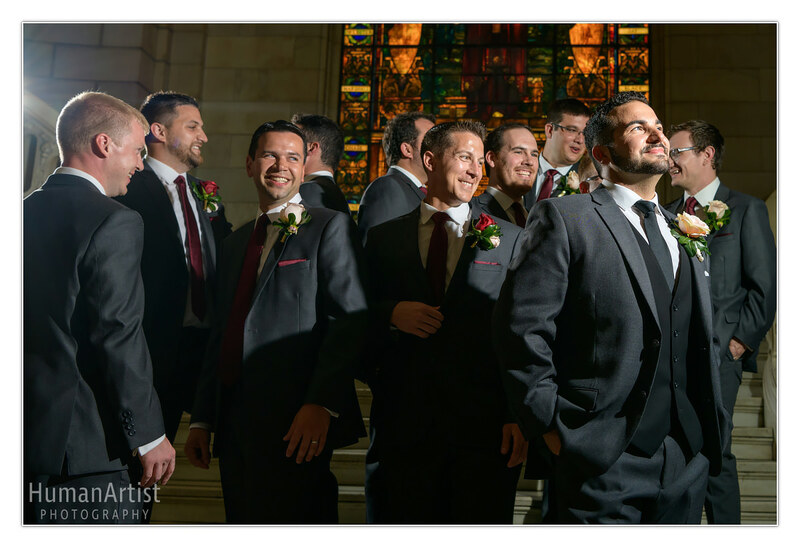 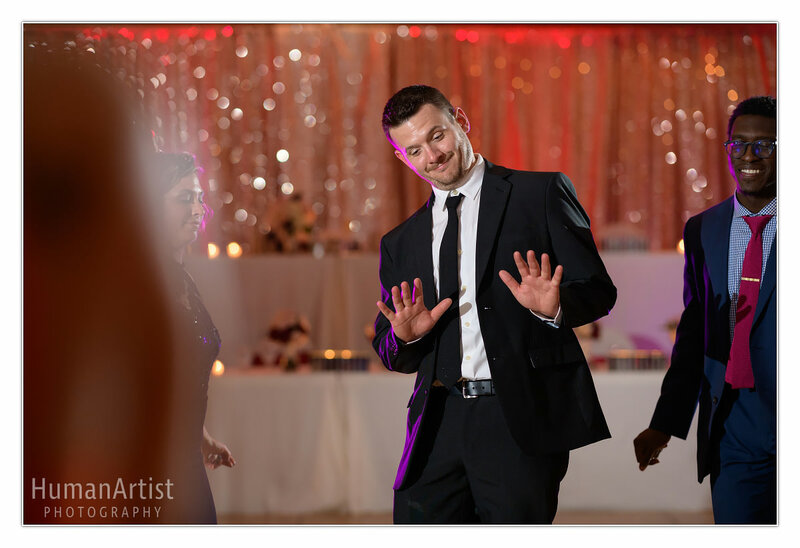 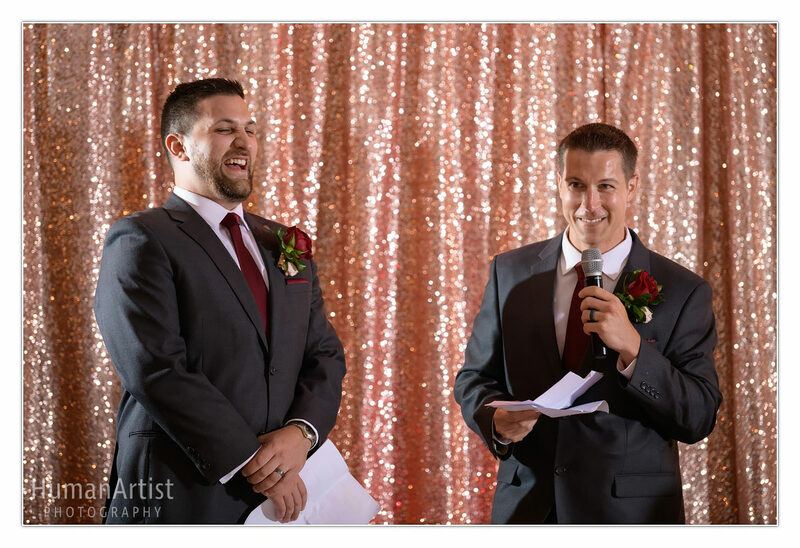 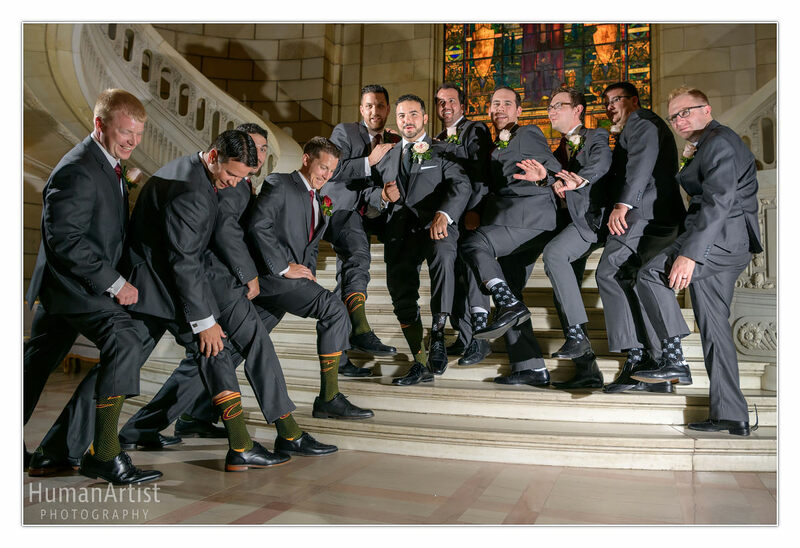 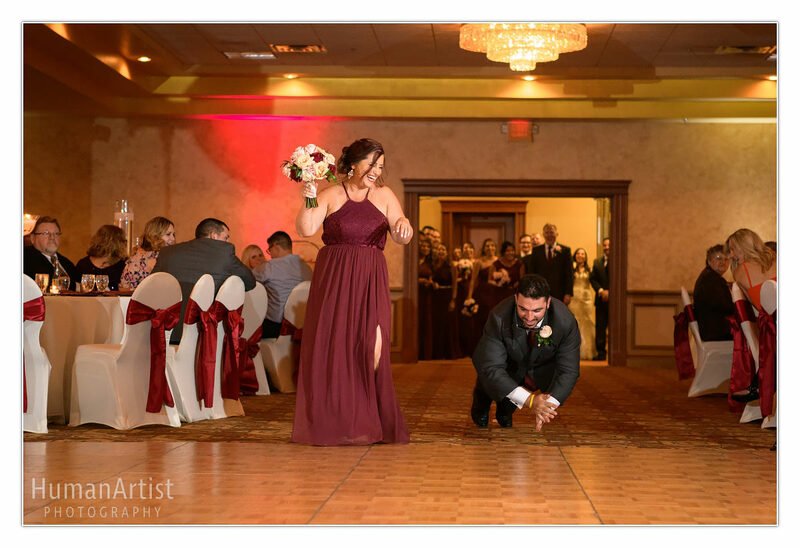 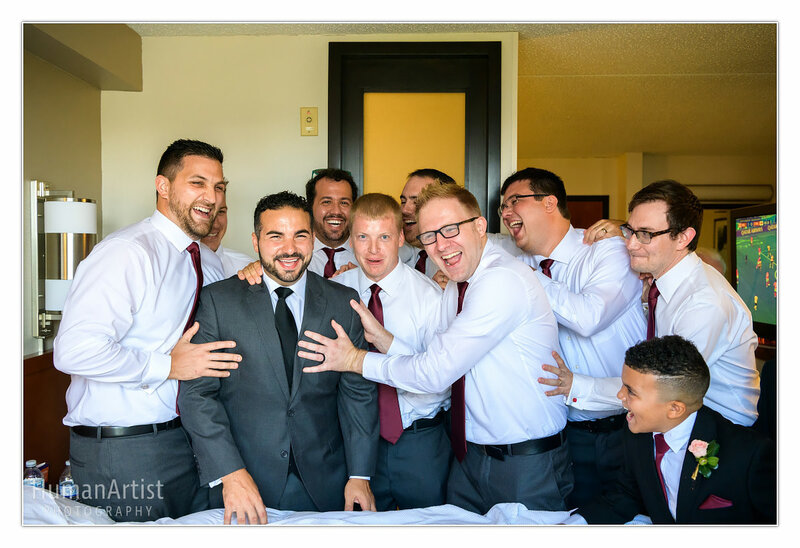 Despite our condensed timeline, we were able to catch lots of fun moments, especially between Joseph and his groomsmen, along the way. 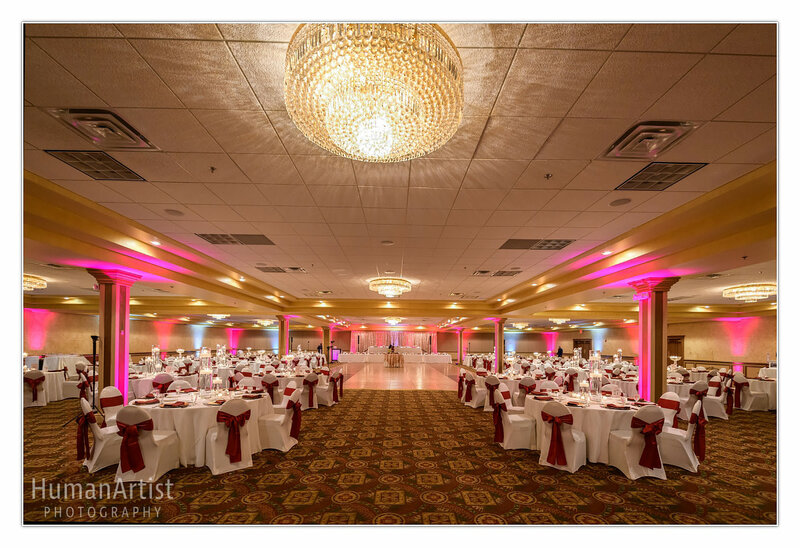 Following a quick stop at East 4th Street, we headed down Chevrolet Boulevard to cocktail hour at La Villa Banquet Centers. 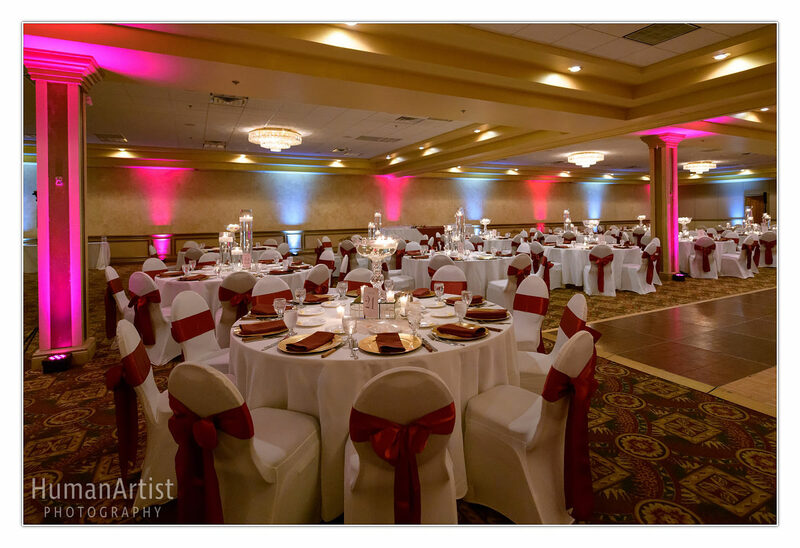 This place was somehow perfectly intimate for a gathering of hundreds and hundreds of guests. 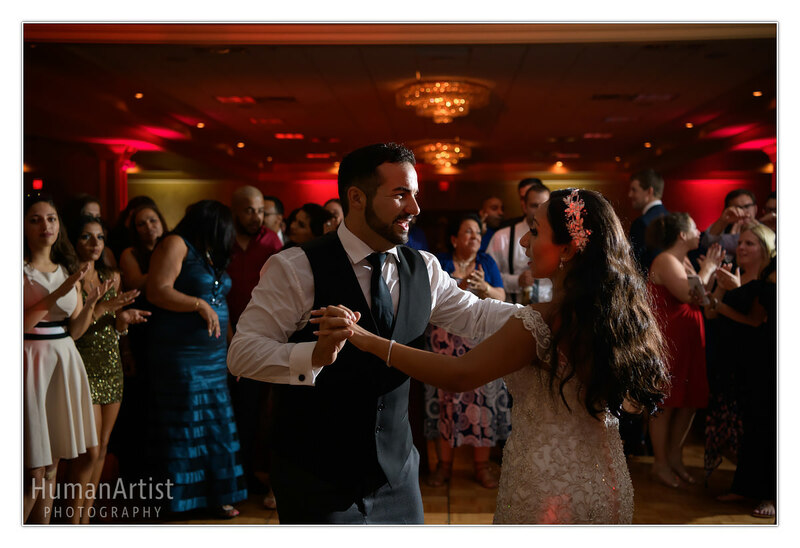 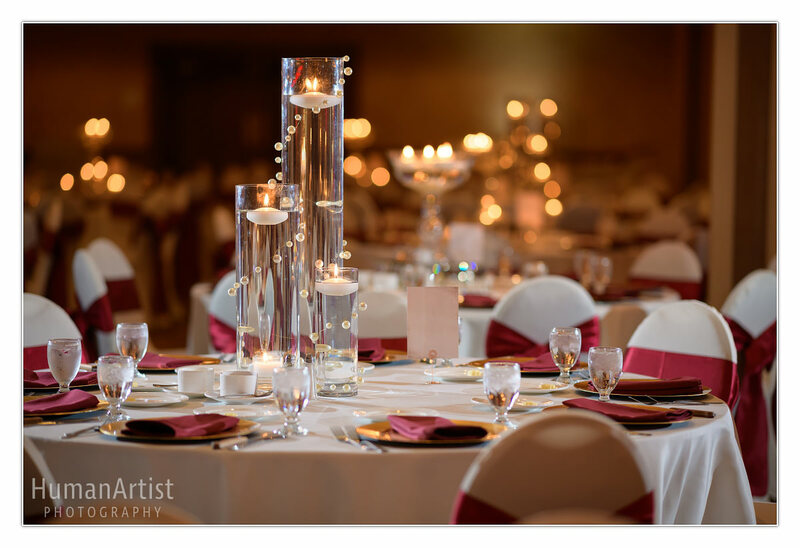 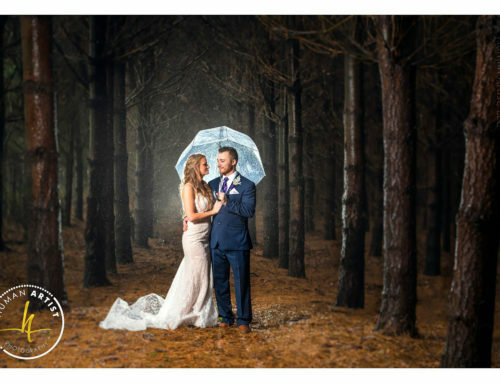 The low ceilings and a warm glow of room created the perfect atmosphere! 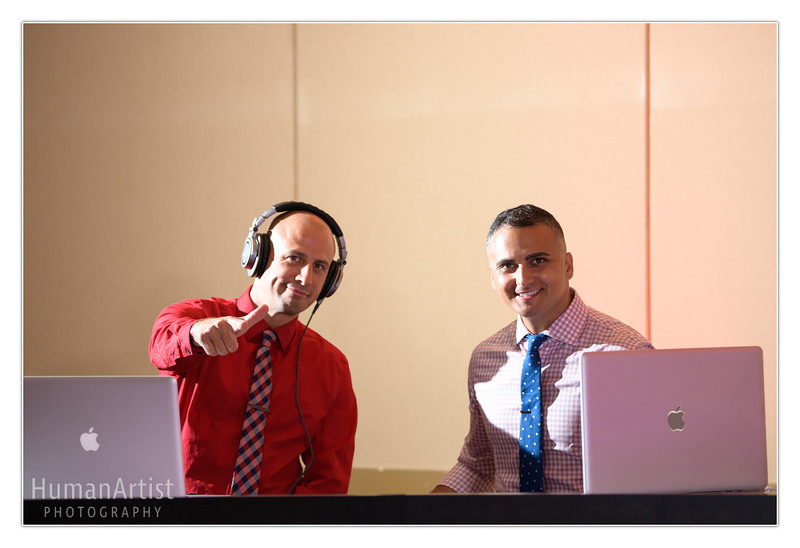 Thanks to the support of DJ Kyro, the evening was perfectly paced and the guests were happy to dance the night away. 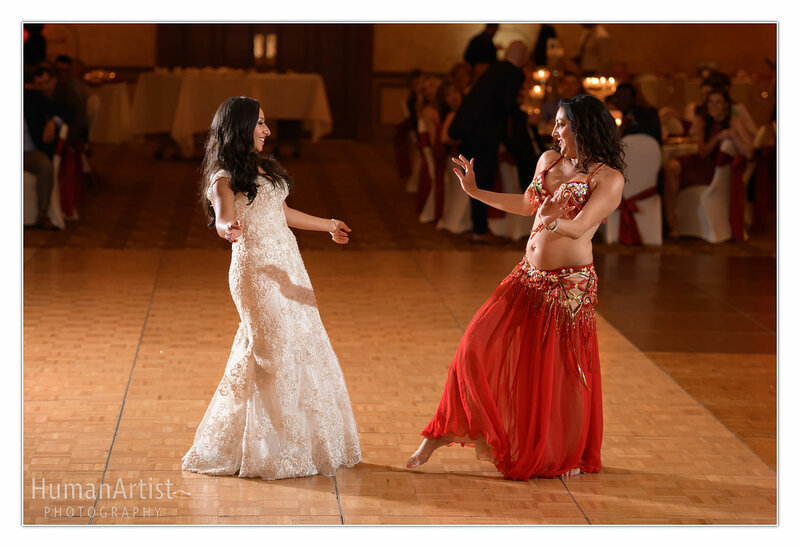 There were too many highlights of the night to recount them all, but a surprise belly dance performance, a bobble-head cake topper that looked quite like Jessica and Joseph, a hilariously straightforward speech from the father of the groom, and a special “right of passage” sing-along from the groomsmen to welcome the bride, were a few that stood out. 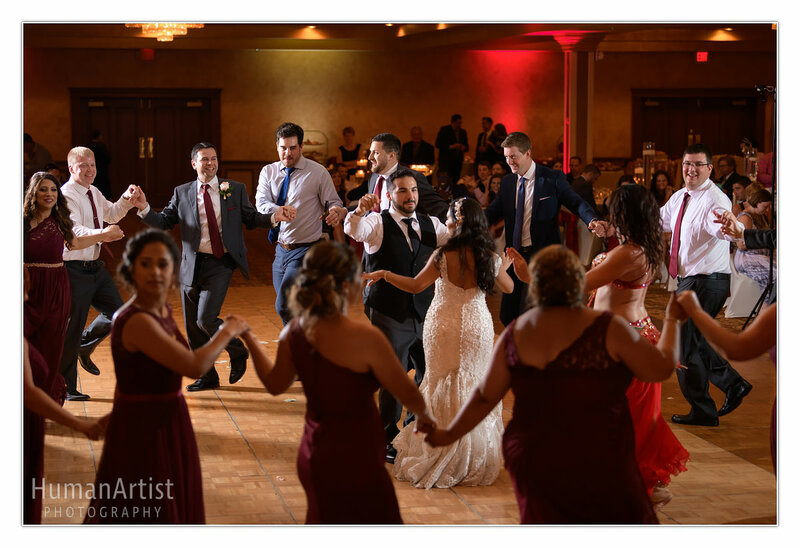 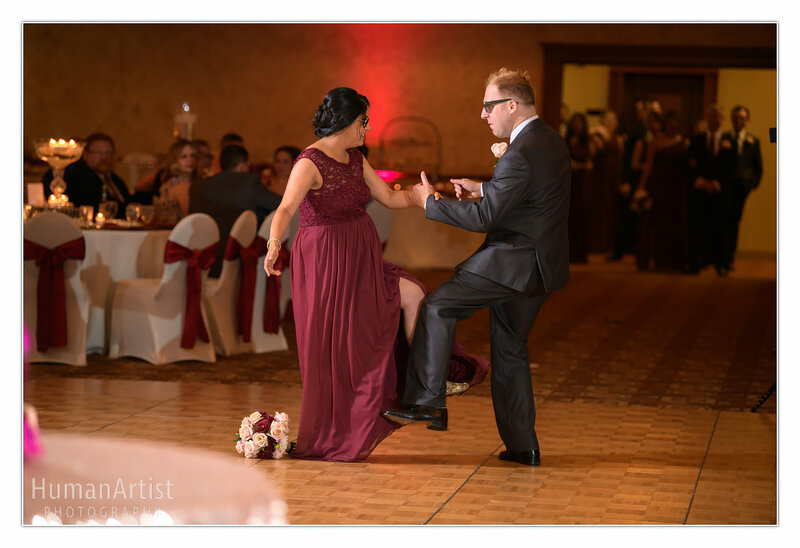 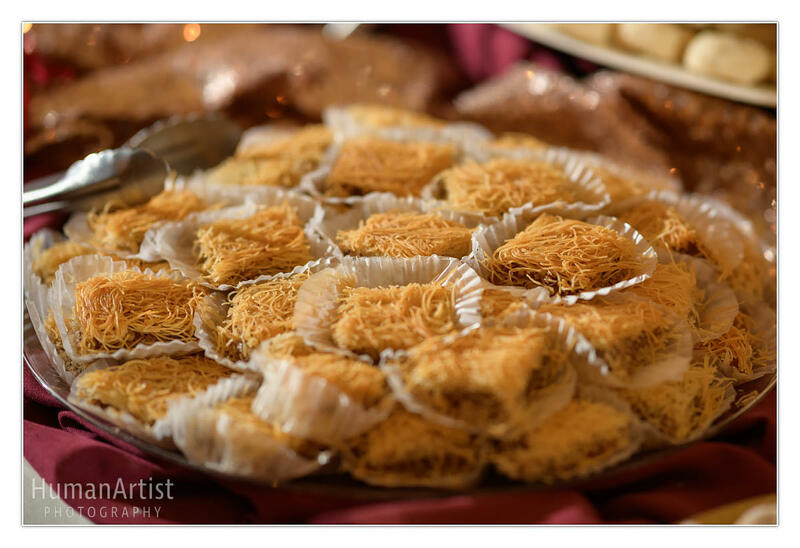 The dance floor was always packed, for both the Italian tarantellas and Egyptian dances, and the endless cookie tables received loads of attention! 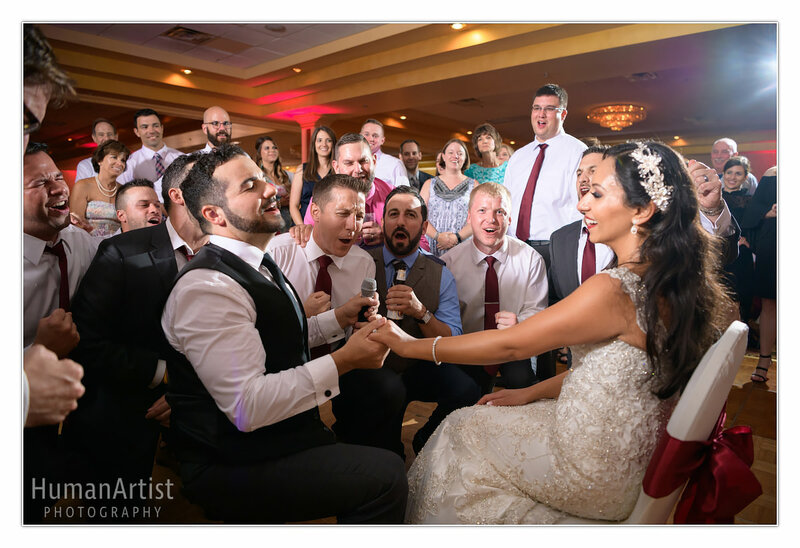 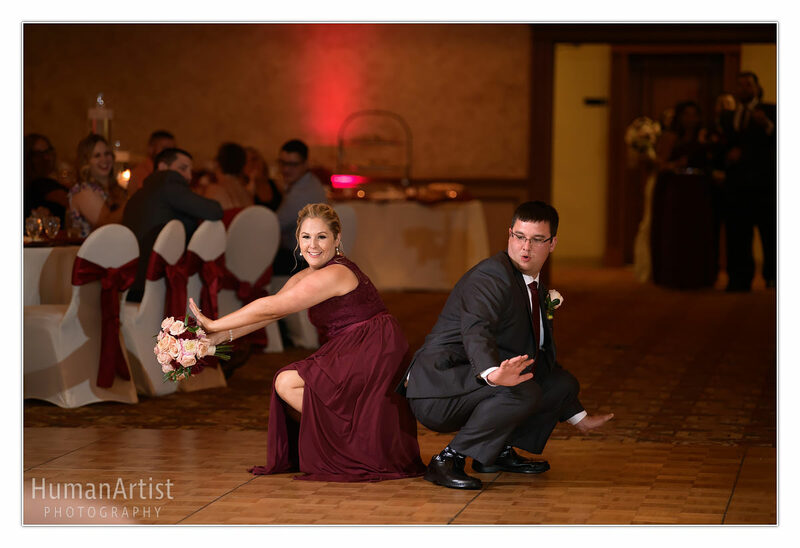 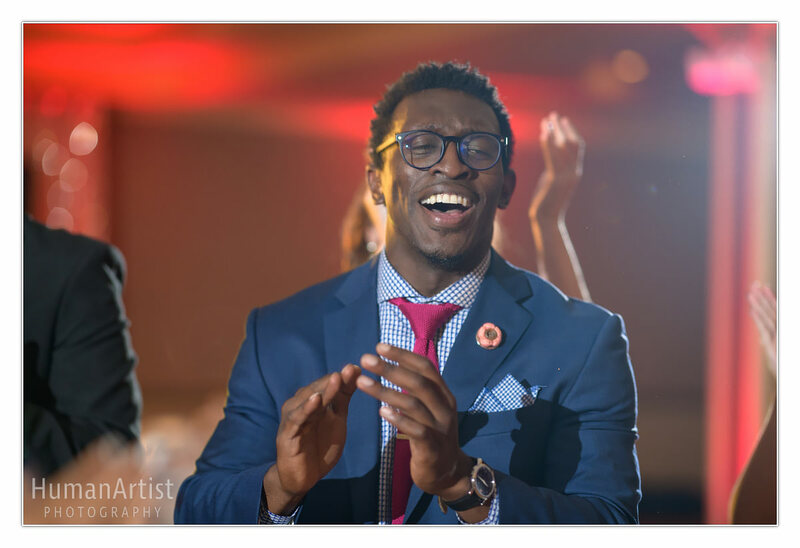 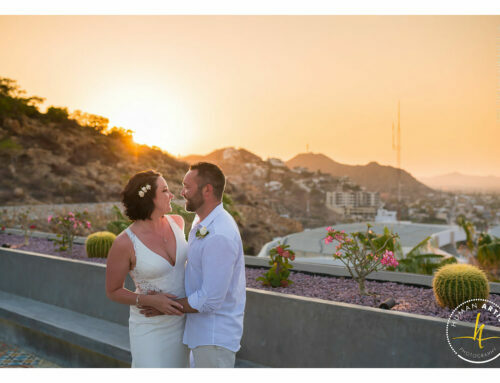 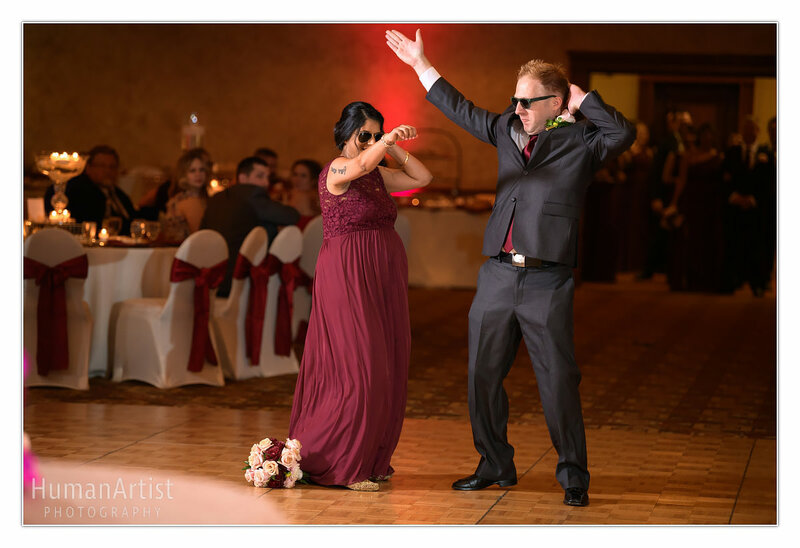 Jessica and Joseph’s wedding day was marked by an incredibly lively and supportive energy. 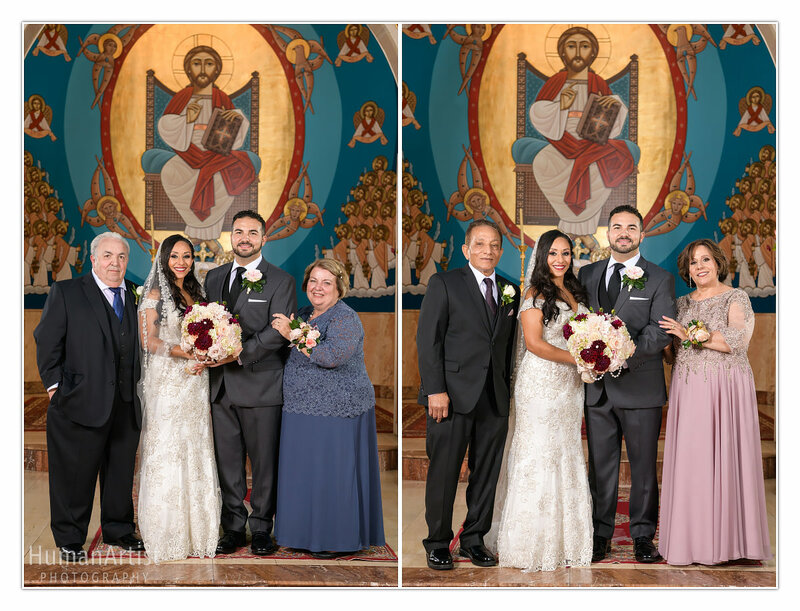 We wish that Jessica and Joseph, and all of our couples, continue to grow together with each other and in their relationships with family and friends! 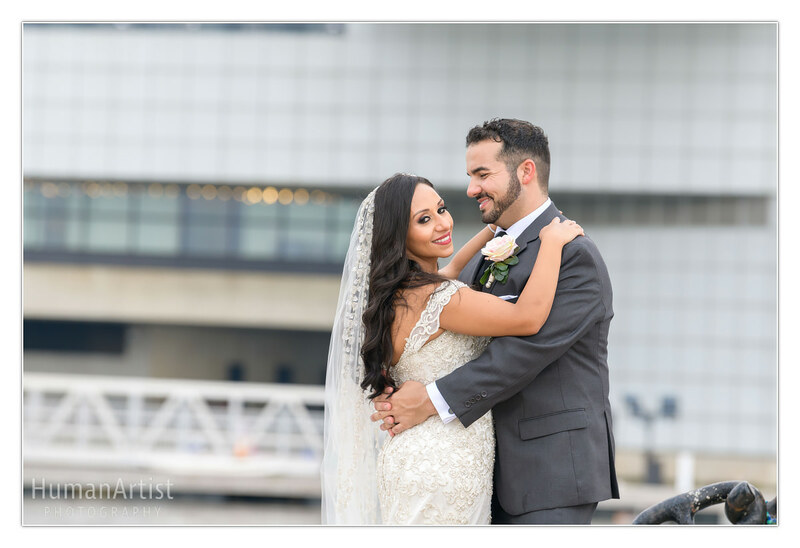 We wish you two so much love and success in your greatest dreams!